The Bible doesn’t give us many details about Jesus’ childhood. We jump from the Nativity to Jesus at age 12 speaking to the temple elders and then skip to Him at age 30. This Biblical drama attempts to offer a glimpse into the life of the Holy Family, with young Jesus at its centre. Our story finds Jesus (Greaves-Neal) at seven years of age. He has lived in Alexandria, Egypt with his parents Joseph (Walsh) and Mary (Lazzaro) since they fled Israel, when King Herod the Great decreed that all boys aged under two be slaughtered. Acting on a vision he has received, Joseph takes Mary and Jesus back to Nazareth. The family unit also includes Jesus’ cousin/adopted brother James (Finn Ireland), Joseph’s brother Cleopas (McKay) and Cleopas’ wife Miriam (Agni Scott). 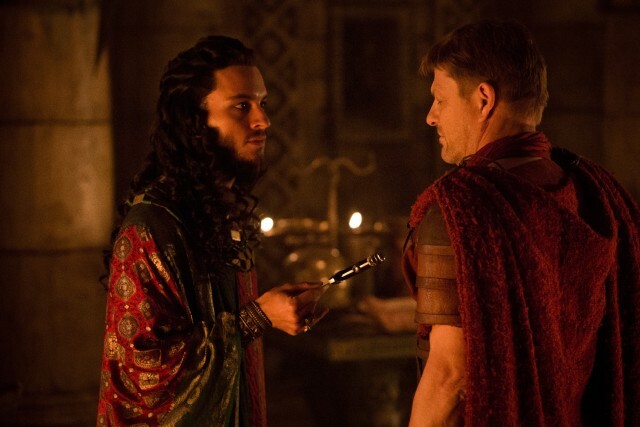 The new king, Herod the Great’s son Herod Antipas (Bailey), charges Roman centurion Severus (Bean) with tracking down and killing the young Jesus, after hearing rumours of a boy performing miracles. In treacherous times, the Young Messiah must come to grips with the truth about why He is on this earth. 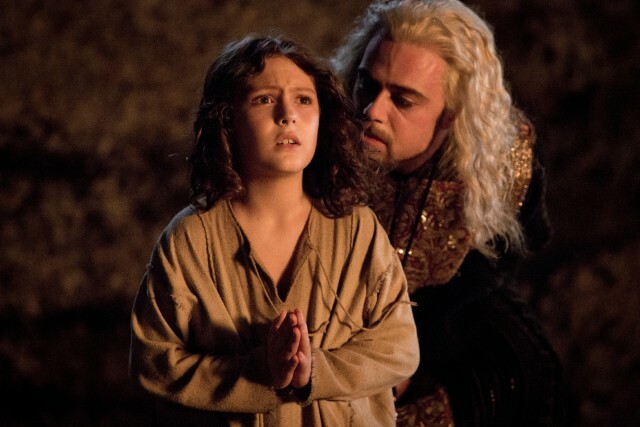 The Young Messiah is based on the novel Christ the Lord: Out of Egypt, by Anne Rice. Rice, known for her vampire novels, has had a fascinating personal journey, having been raised Roman Catholic, leaving the religion at age 18, returning to Catholicism in 1998, then distancing herself from Christianity at large in 2010, expressing her grievances with the state of organised Christianity. 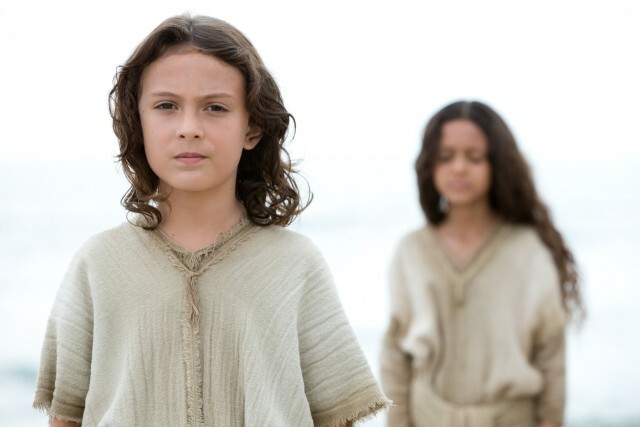 Unfortunately, The Young Messiah is not quite as interesting a story, and it’s easy to see why the filmmakers were boxed in. First, there’s the fact that the Holy Family is revered by large numbers, and their depiction cannot offend the sensibilities of the faithful. Second, there’s the “prequel trap” – we already know where Jesus ends up, so it will take a fair bit to get us invested in this story set earlier in His life. Working within these boundaries, the tale can’t help but feel stifled and slow at times. 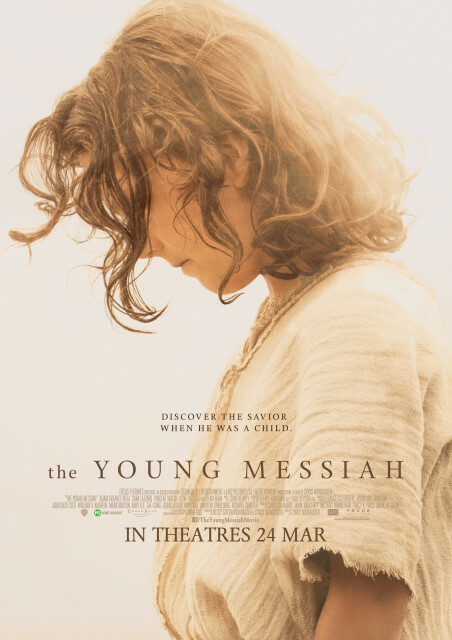 The Young Messiah is directed by Cyrus Nowrasteh, an American filmmaker of Persian descent. He adapted Rice’s novel into a screenplay alongside his wife Betsy Giffen Nowrasteh. Nowrasteh’s work has attracted controversy in the past; he wrote the docu-drama miniseries The Path to 9/11 alongside his wife and also wrote and directed The Stoning of Soraya M., about the human rights crisis in Iran. Being released around Easter and marketed to believers, The Young Messiah is very tame by comparison. There is a valiant effort made to humanise the Holy Family without committing blasphemy, and the anguish experienced by Joseph and Mary as they make sense of how to bring up God incarnate does have some emotional resonance. The family dynamics get fleshed out to a satisfactory degree, even if nothing quite riveting comes of it. Considerable stakes are established, but because we know it’s not Jesus’ time to die yet, none of them actually take hold. The way Mary and Joseph talk about Jesus’ abilities in hushed tones, it seems like a bald guy in a chrome wheelchair will show up at any moment to whisk Jesus to a school for gifted youngsters. Portraying Jesus Christ, a widely-worshipped religious figure, is a challenge for any actor, seeing as how different theologians and believers at large view Him differently. Portraying Jesus as a child has its own set of challenges on top of that. How human is too human? How “wise beyond His years” is too much? What should Jesus’ level of awareness of His divinity be exactly? Should the young Jesus be innocent and filled with hope, or already world-weary and burdened with His destiny? For Greaves-Neal, known to Sherlock fans as the pageboy Archie from The Sign of Three, it’s all too much to parse. He seems unable to eloquently package this into a performance, so unfortunately, Greaves-Neal often comes off as awkwardly stilted. Walsh’s Joseph is as sturdy and reliable as the furniture he builds and Lazarro finds an adequate blend of maternal warmth and youthful vulnerability as Mary. McKay provides some much-needed levity as the comic relief uncle without causing too jarring a tonal shift. Bean is the biggest name by far here and seems reluctant to be present, trundling through his part as the designated antagonist. When Herod Antipas is berating Severus for failing in his mission on the first try, Bean mutters “yes, my lord, I understand. It’s difficult,” with a laughable flatness. Bailey’s flamboyant, fey portrayal of Herod Antipas is silly rather than threatening. Keenan’s character, credited as “the Demon”, can only be seen by Jesus, wears eyeliner and a black cloak and is first seen crunching on an apple. Subtle. The production values are passable – the film was shot on location in Matera, Italy, which has doubled for ancient Israel in numerous Biblical movies before. By focusing on Jesus at age seven, The Young Messiah treads ground that has not been covered countless times in earlier Biblical productions. It should play relatively well to faithful audiences, depending on one’s specific beliefs – for example, there are some who hold to the idea that Jesus did not perform miracles prior to turning the water into wine at the wedding of Cana, and here we see the young Jesus work wonders long before that incident. There is a “preaching to the choir” quotient here, if not as overwhelmingly as in other faith-based films, but it’s unlikely to result in mass conversions in the cinema. Summary: The Young Messiah has to play by established rules and thus cannot take any significant risks in its portrayal of Jesus’ childhood. It’s almost moving at times, but clunky at others. 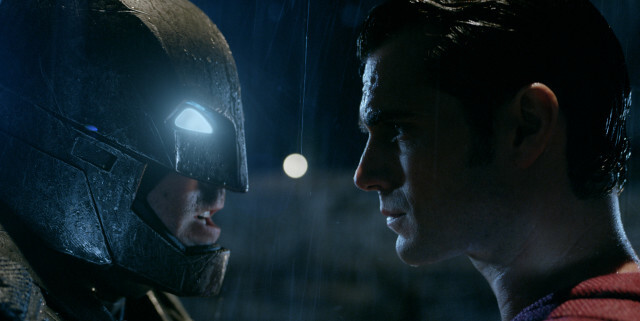 The Dark Knight will come face to face with the Man of Steel on the big screen at long last in this month’s superhero blockbuster, Batman v Superman: Dawn of Justice. The two big guns in DC’s stable of characters have not always seen eye to eye, but have been associated with each other since they first shared the cover of New York World’s Fair Comics #2 in 1940, having their first proper crossover story in 1952. Interestingly, the first shared storyline wasn’t in the comics but in the Adventures of Superman radio play, in 1945. We’ll be taking a look at some of this duo’s memorable encounters in the realm between comics and live-action movies: that of animation. For a long time, DC fans thought a live-action World’s Finest movie would be forever outside the realm of possibility, with an attempt in the early 2000s falling through. 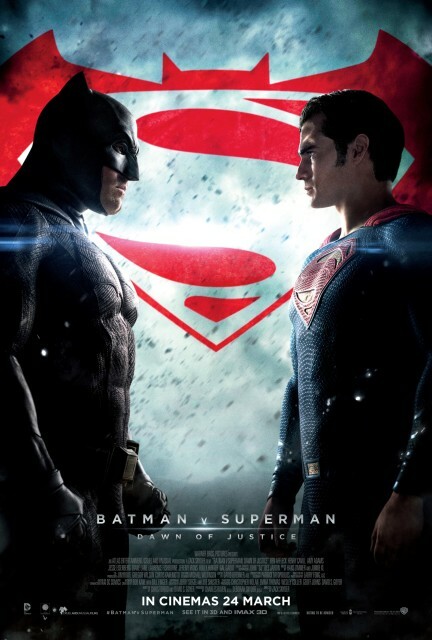 However, the various animated alternatives were more than an adequate substitute and after the release of Batman v Superman: Dawn of Justice, it will be fun to compare the common threads that movie shares with previous depictions of the earth-shattering first encounter between two very different heroes. Allow us to issue the disclaimer any writer has to when discussing comics-related media: this might be confusing. 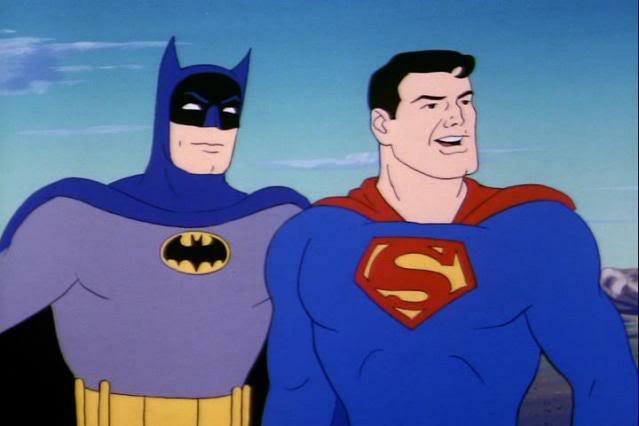 In 1968, CBS aired The Batman/Superman Hour, a Filmation animated series that consisted of episodes from The Adventures of Batman packaged together with shorts from The New Adventures of Superman and The Adventures of Superboy. Now, the name “The Batman/Superman Hour” naturally makes it sound like our heroes team up, but they do not and the Batman and Superman segments of the show are separate. The Batman/Tarzan Adventure Hour, aired from 1977-1978, shares a similar principle. 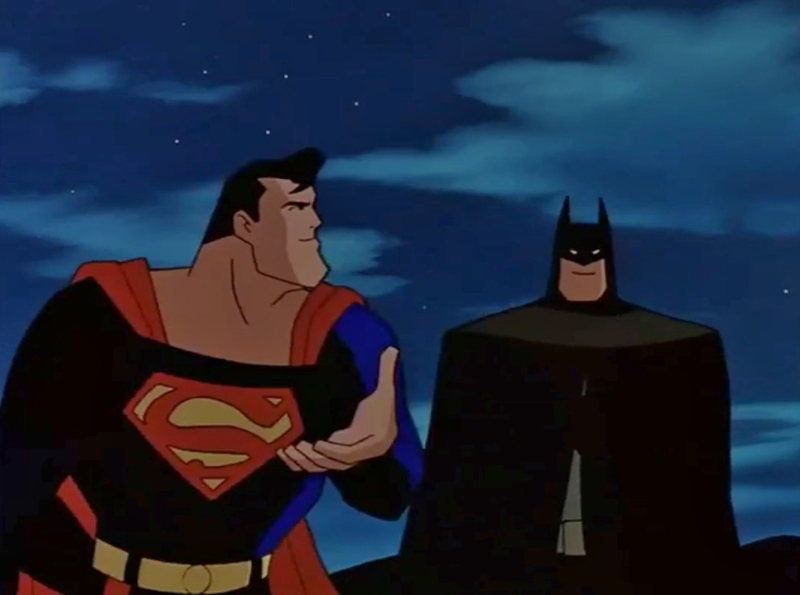 The first time Batman and Superman actually interacted with each other in a cartoon was in the animated series Super Friends, produced by Hanna-Barbera, the animation studio known for Scooby-Doo, The Flintstones, The Jetsons and Yogi Bear. 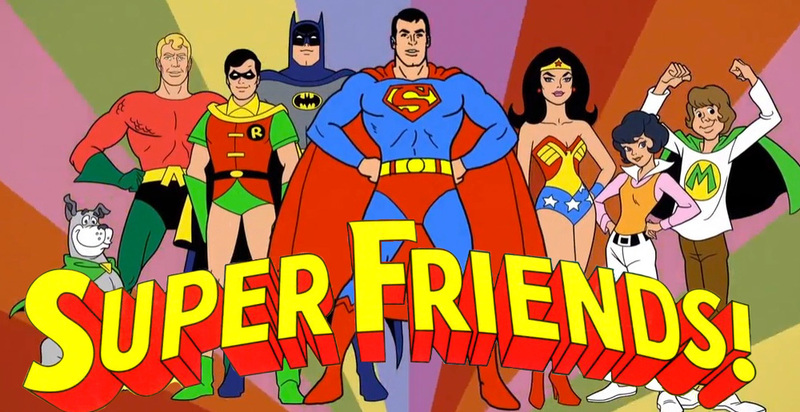 Based on the Justice League comics, the first season of Super Friends featured Batman, Superman, Wonder Woman, Aquaman and Robin as the core members, with new characters being added over the course of the show’s run. Additionally, the sidekick characters of Wendy, Marvin and Wonder Dog were created for the show, for kids to identify with. Super Friends popularised the catch phrase “Meanwhile, at the Hall of Justice…”, delivered by the Narrator. Super Friends was, as expected of Saturday morning cartoons at the period, generally pretty goofy and it’s been poked fun at a fair few times in recent memory. 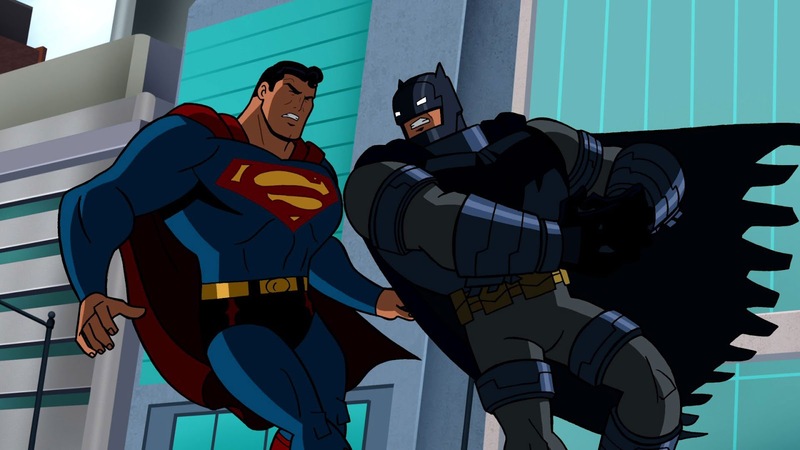 Also, even though this is the first time Batman and Superman are seen on the same team in a cartoon, their first meeting is not depicted. 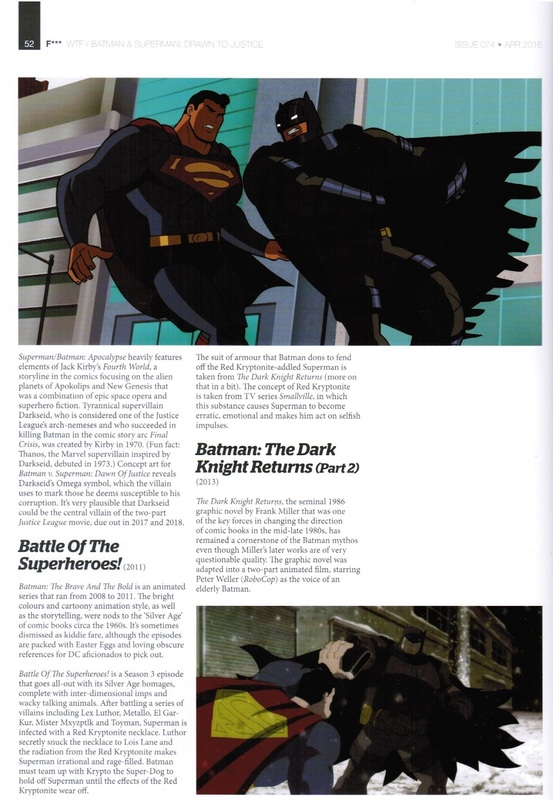 Episodes that focus specifically on the duo include Invasion of the Brain Creatures, in which Batman and Superman get possessed by – you guessed it – brain creatures, and Warpland, in which they’re pulled into a space warp and Superman is transformed into an eagle and Batman gets turned into an actual bat. It’s safe to assume these wacky fates won’t befall Henry Cavill and Ben Affleck. The DC Animated Universe (DCAU), which began with 1992’s Batman: The Animated Series (B:TAS), is widely regarded by fans as the pinnacle of DC media outside the comics. 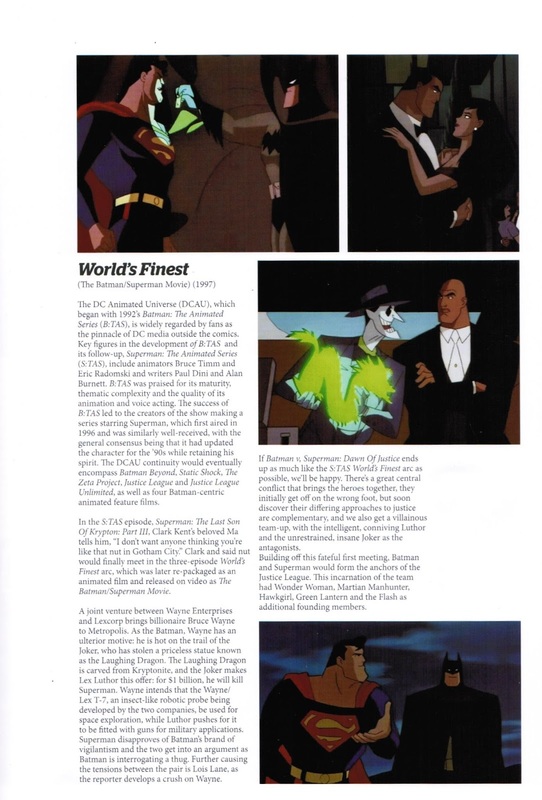 Key figures in the development of B:TAS and its follow-up Superman: The Animated Series (S:TAS) include animators Bruce Timm and Eric Radomski and writers Paul Dini and Alan Burnett. B:TAS was praised for its maturity, thematic complexity and the quality of its animation and voice acting. 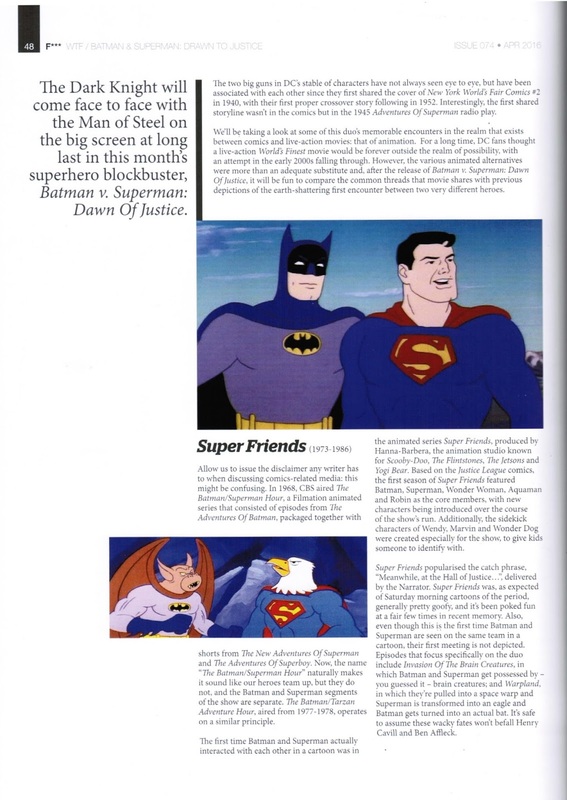 The success of B:TAS led to the creators of the show making a series starring Superman, which first aired in 1996 and was similarly well-received, with the general consensus being that it had updated the character for the 90s while retaining his spirit. 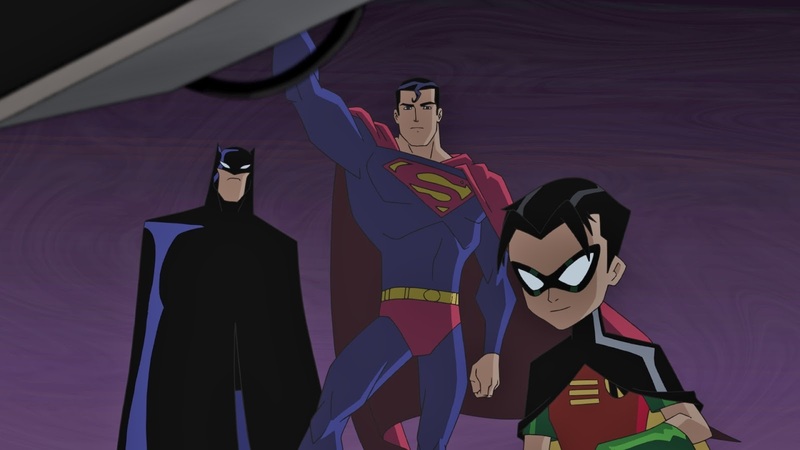 The DCAU continuity would eventually encompass Batman Beyond, Static Shock, The Zeta Project, Justice League and Justice League Unlimited, as well as four Batman-centric animated feature films. In the S:TASepisode Superman: The Last Son of Krypton: Part III, Clark Kent’s beloved Ma tells him “I don’t want anyone thinking you’re like that nut in Gotham City.” Clark and said nut would finally meet in the three-episode World’s Finestarc, which was later re-packaged as an animated film and released on video as The Batman/Superman Movie. 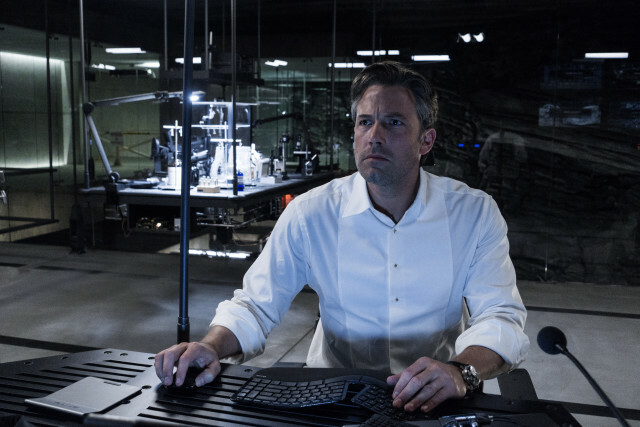 A joint venture between Wayne Enterprises and Lexcorp brings billionaire Bruce Wayne to Metropolis. As the Batman, Wayne has an ulterior motive: he is hot on the trail of the Joker, who has stolen a priceless statue known as “the Laughing Dragon”. 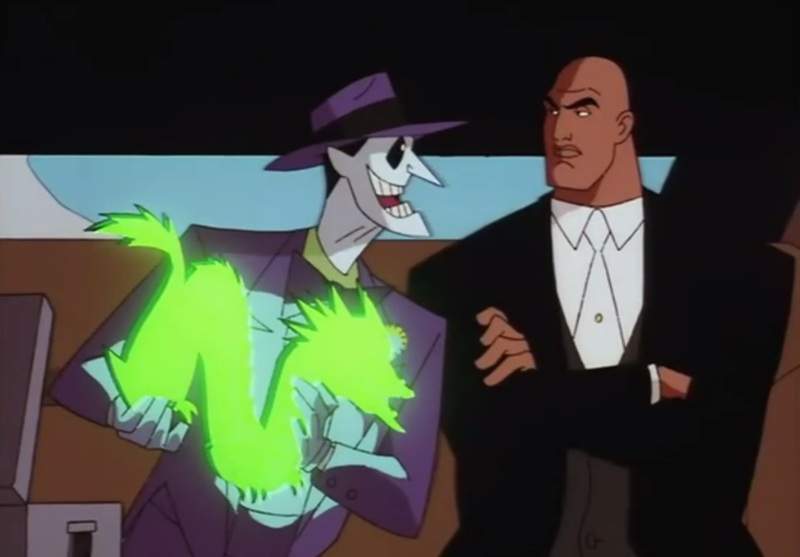 The Laughing Dragon is carved from Kryptonite, and the Joker makes Lex Luthor this offer: for $1 billion, he will kill Superman. Wayne intends that the Wayne/Lex T-7, an insect-like robotic probe being developed by the two companies, be used for space exploration, while Luthor pushes for it to be fitted with guns for military applications. Superman disapproves of Batman’s brand of vigilantism and the two get into an argument as Batman is interrogating a thug. 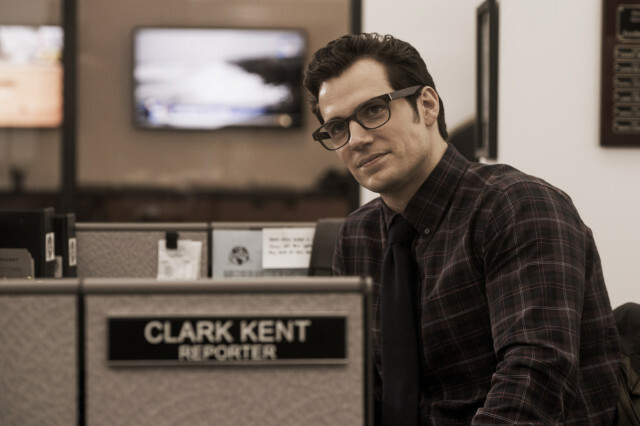 Further causing the tensions between the pair is Lois Lane, the reporter developing a crush on Wayne. 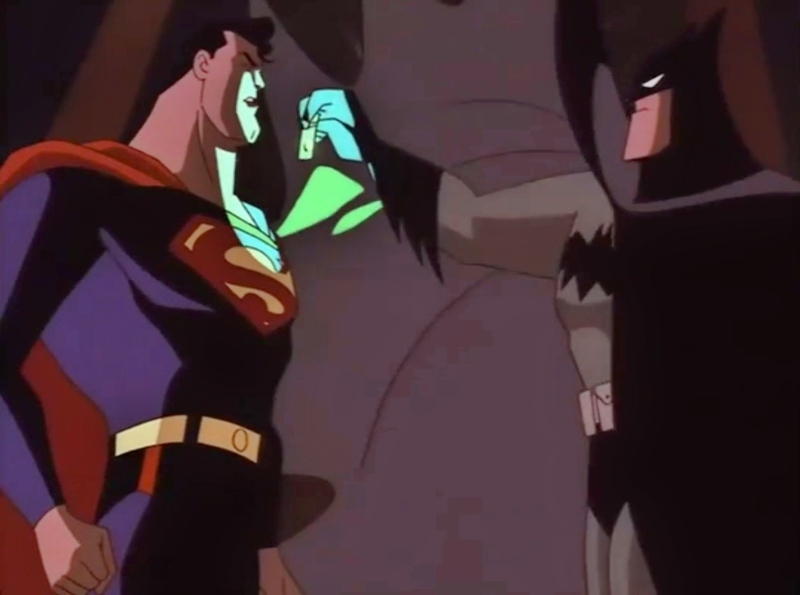 If Batman v Superman: Dawn of Justice ends up as much like the S:TAS World’s Finest arc as possible, we’ll be happy. There’s a great central conflict that brings the heroes together, they initially get off on the wrong foot but soon discover their differing approaches to justice are complementary, and we also get a villainous team-up, with the intelligent, conniving Luthor and the unrestrained, insane Joker as the antagonists. Building off this fateful first meeting, Batman and Superman would form the anchors of the Justice League. This incarnation of the team had Wonder Woman, Martian Manhunter, Hawkgirl, Green Lantern and the Flash as additional founding members. In 2004, an animated series called The Batman began airing. This show was unrelated to the DCAU, with a different voice cast, creative team and featuring character designs by Jeff Matsuda of The Jackie Chan Adventures. The Batman was not warmly received by fans of B:TAS and its affiliated shows, but things started to turn around with the fourth season, which introduced Robin (in this continuity, Batgirl became Batman’s sidekick first) and was closer to B:TAS in tone. In the last episode of Season Four, Batman meets Martian Manhunter, Green Lantern, Green Arrow, Hawkman and the Flash aboard the Watchtower satellite, base of operations for the Justice League. 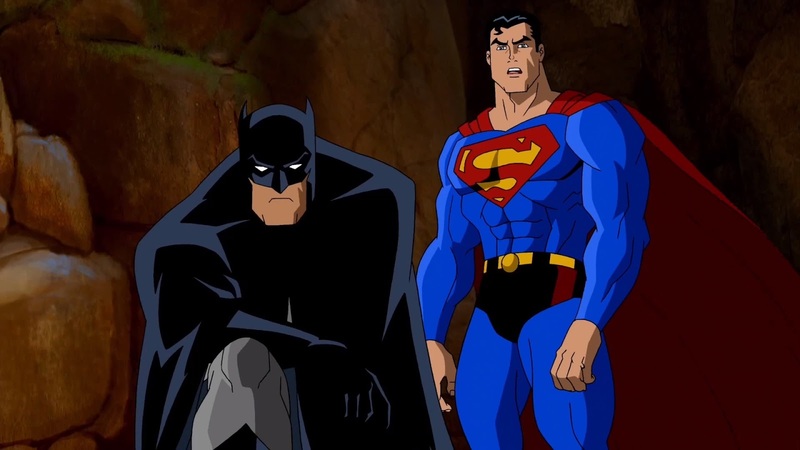 Season Five kicked off the with The Batman/Superman Story, a two-parter in which this version of the Caped Crusader and the Big Blue Boy Scout first meet. Superman has arrived in Gotham to deliver a check from the city of Metropolis to aid rebuilding efforts following an alien invasion of Gotham in the last season. This is interrupted by Metallo, who has been sent by Lex Luthor to kill Superman. When Metallo fails, Luthor unleashes members of Batman’s rogues gallery, including Black Mask, Bane, Clayface and Poison Ivy, to finish Superman off after kidnapping Lois Lane. Luthor drugs Superman with Poison Ivy’s mind control gas, which Luthor has laced with Kryptonite. Donning mechanized suits of armour, Batman and Robin have to engage in combat with Superman, now under Luthor’s thrall. 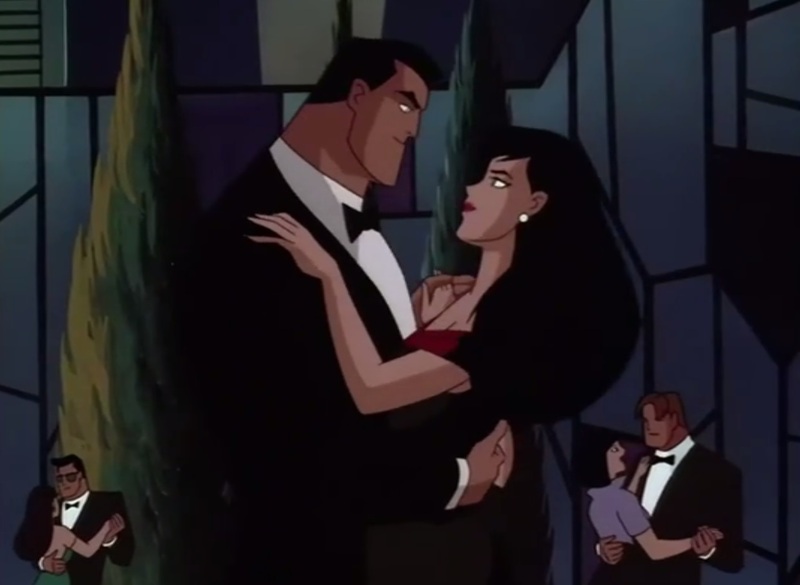 Several voice actors from the DCAU were roped in to reprise their roles, including George Newbern as Superman, Clancy Brown as Lex Luthor, Dana Delaney as Lois Lane and Lex Lang as Metallo. Newbern replaced Daly as the voice of Superman in the Justice League animated series. Luthor co-opting Poison Ivy’s mind control plant spores to use against Superman is reminiscent of when Poison Ivy directly controlled Superman’s mind in the comic book arc Batman: Hush. Also, this incarnation of Mercy Graves, Luthor’s icy personal assistant, appears to be of Asian descent and is voiced by Singaporean actress Gwendoline Yeo. In Batman v Superman: Dawn of Justice, Mercy Graves is also Asian, played by The Wolverine’s Tao Okamoto. “So did I, once,” Batman answers. “But I found out you never know when you might need a friend.” Aww! Warner Bros. Animation and Warner Premiere have been steadily releasing direct-to-video DC animated films since 2007, putting out three such movies on average per year. 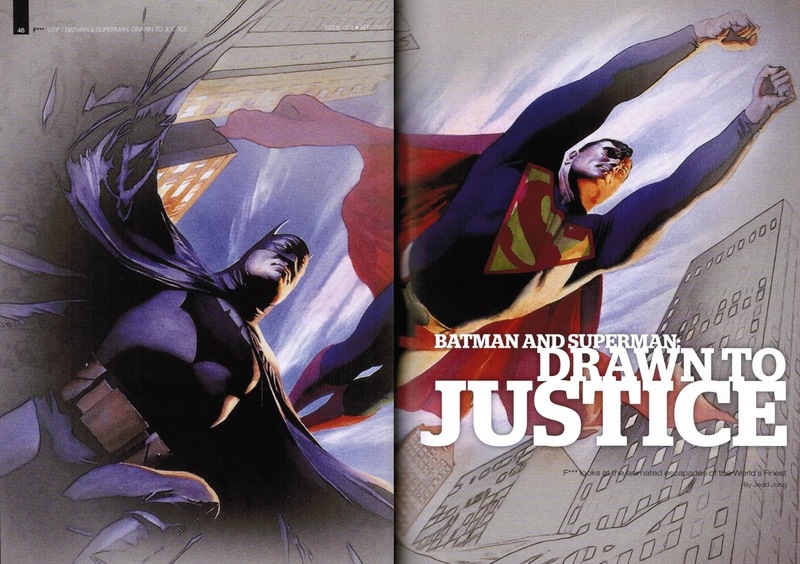 These films do not tie in to the DCAU and while some of the DC Animated Movies are related, some are stand-alone stories directly adapted from existing graphic novels or comic book story arcs. 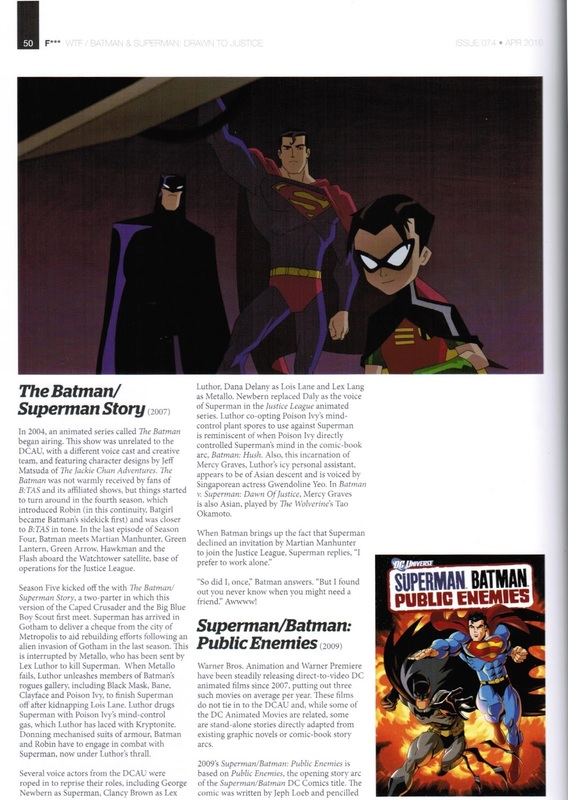 2009’s Superman/Batman: Public Enemies is based on Public Enemies, the opening story arc of the Superman/Batman DC Comics title. The comic was written by Jeph Loeb and pencilled by Ed McGuinness, with the animation style in this movie taking inspiration from McGuinness’ designs. It’s Batman and Superman against the world as Lex Luthor is elected president, forming a government-assembled task force of superheroes including Captain Atom, Katana, Black Lightning, Power Girl, Starfire, and Major Force. The World’s Finest remain untrusting of Luthor, and their suspicions are confirmed when the President frames Superman for killing Metallo and puts a one-billion-dollar bounty on the Man of Steel’s head. Batman and Superman fend off a horde of supervillains, including Cheetah, Bane, Captain Cold, Black Manta, Deadshot, King Shark and Lady Shiva, in an attempt to prove Superman’s innocence. They also have to stop a meteorite from hitting the earth. In the meantime, Power Girl’s loyalties are torn, and government official Amanda Waller discovers the extent of Luthor’s schemes. Superman/Batman: Public Enemies showcases just what a great team the Dark Knight and Man of Steel make and that it’s generally better off if they figure a way to work together instead of trying to take each other down. Voice director Andrea Romano fought hard to get many of the voice actors from the DCAU to reprise their roles. 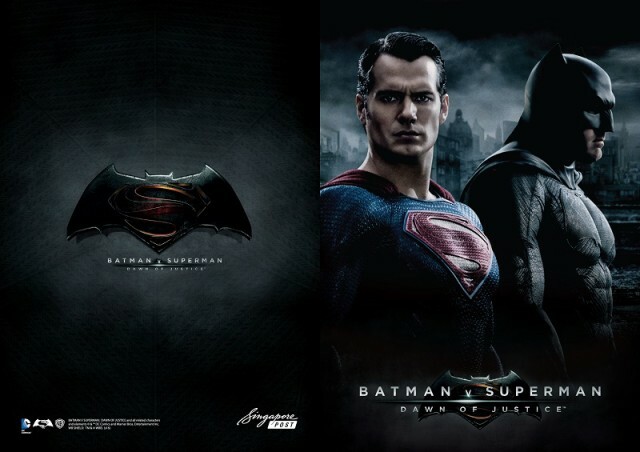 Conroy is back as Batman, Daly as Superman, Brown as Luthor and CCH Pounder as Amanda Waller. Allison Mack, who played Chloe Sullivan on Smallville, voices Power Girl. 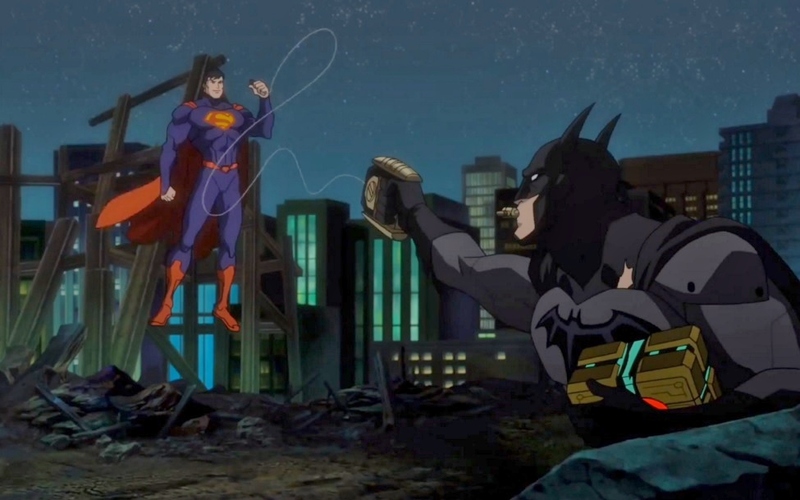 Public Enemies was followed up with a direct sequel, Superman/Batman: Apocalypse, based on the comics arc entitled The Supergirl from Krypton, also written by Loeb. This time, the animation style was based on the art of late penciller Michael Turner. In this story, Batman and Superman first meet Kara Zor-el a.k.a. Supergirl, Superman’s cousin, when her spaceship crash-lands in Gotham Harbour. While Superman welcomes his long-lost relative and helps her adjust to life on earth, Batman has his suspicions of the newcomer. Agreeing with Batman, Wonder Woman and Harbinger take Kara to Themyscira where she can be trained, and Superman reluctantly agrees, preferring to watch over Kara himself. Darkseid, the ruthless ruler of the planet Apokolips, learns of Kara’s arrival on earth and plots to capture her and make her serve him as one of the Female Furies. When Kara is abducted, Batman, Superman and Wonder Woman contact Big Barda, a former Female Fury who has defected to the side of good, to help them journey to Apokolips to rescue Kara. The Trinity has to battle a brainwashed Kara and break Darkseid’s control over her. 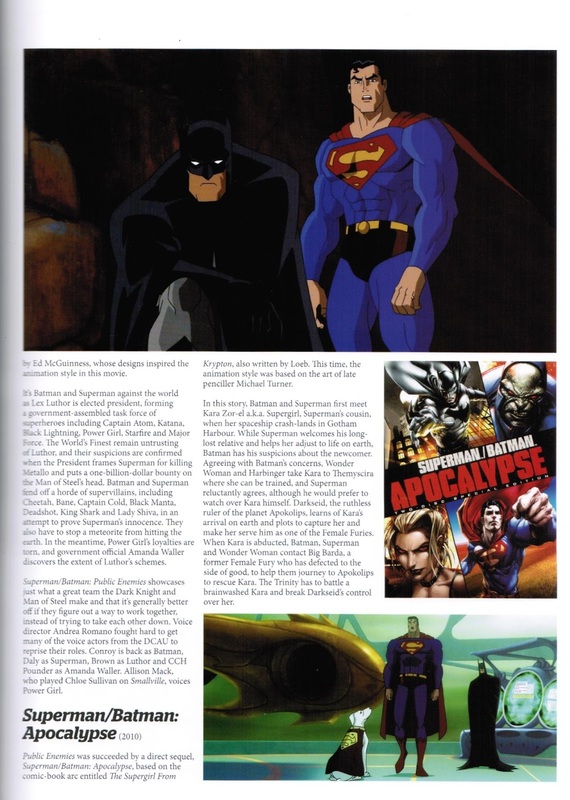 Superman/Batman: Apocalypse heavily features elements of Jack Kirby’s Fourth World, a storyline in the comics focusing on the alien planets of Apokolips and New Genesis that was a combination of epic space opera and superhero fiction. The tyrannical supervillain Darkseid, considered one of the Justice League’s arch-nemeses and who succeeded in killing Batman in the comics story arc Final Crisis, was created by Kirby in 1970. Thanos, the Marvel supervillain inspired by Darkseid, debuted in 1973. Concept art for Batman v Superman: Dawn of Justicereveals Darkseid’s Omega symbol, which the villain uses to mark those he deems susceptible to his corruption. It’s very plausible that Darkseid could be the central villain of the two-part Justice League movie, due out in 2017 and 2018. Batman: The Brave and the Bold is an animated series that ran from 2008 to 2011. The bright colours and cartoony animation style, as well as the storytelling, were nods to the “Silver Age” of comic books circa the 1960s. It’s sometimes dismissed as kiddie fare, the episodes are packed with Easter Eggs and loving obscure references for DC aficionados to pick out. Battle of the Superheroes! is a Season 3 episode which goes all-out with its Silver Age homages, complete with inter-dimensional imps and wacky talking animals. After battling a series of villains including Lex Luthor, Metallo, El Gar-Kur, Mister Mxyzptlk, and Toyman, Superman is infected with a Red Kryptonite necklace. Luthor secretly snuck the necklace to Lois Lane and the radiation from the Red Kryptonite makes Superman irrational and rage-filled. 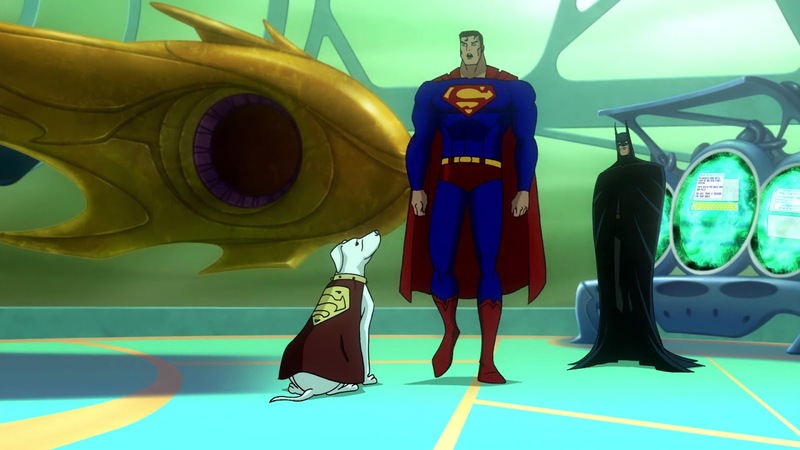 Batman must team up with Krypto the Super-Dog to hold off Superman until the effects of the Red Kryptonite wear off. The suit of armour that Batman dons to fend off the Red Kryptonite-addled Superman is taken from The Dark Knight Returns (more on that in a bit). The concept of Red Kryptonite is taken from the TV series Smallville, in which this substance causes Superman to become erratic, emotional and makes him act on selfish impulses. The Dark Knight Returns, the seminal 1986 graphic novel by Frank Miller which was one of the key forces in changing the direction of comic books in the mid-late 1980s, has remained a cornerstone of the Batman mythos even though Miller’s later works are of very questionable quality. The graphic novel was adapted into a two-part animated film, starring Peter Weller (RoboCop) as the voice of an elderly Batman. The centrepiece of Part 2 is an epic throw-down between Batman and Superman, with the Man of Steel being dispatched by President Ronald Reagan to put an end of Batman’s unchecked vigilante activity. 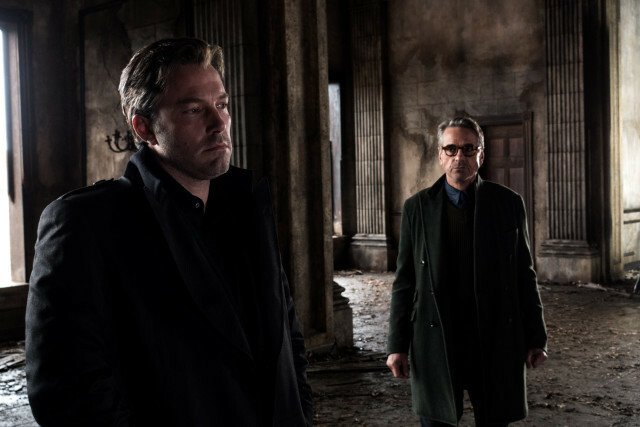 Batman teams up with Oliver Queen a.k.a. Green Arrow, now missing an arm and sporting a full beard. Green Arrow fires Kryptonite arrows at Superman to weaken him while Batman dons a powerful armoured exo-suit to go mano a mano with Superman. 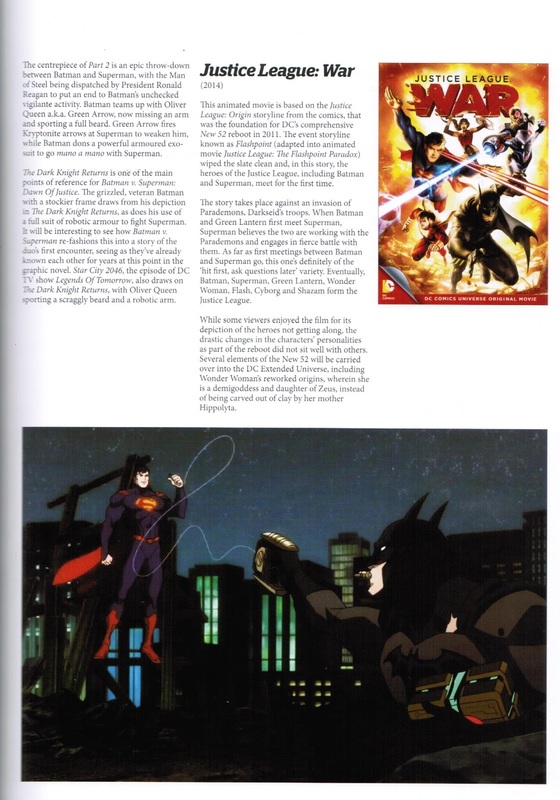 The Dark Knight Returns is one of the main points of reference for Batman v Superman: Dawn of Justice. 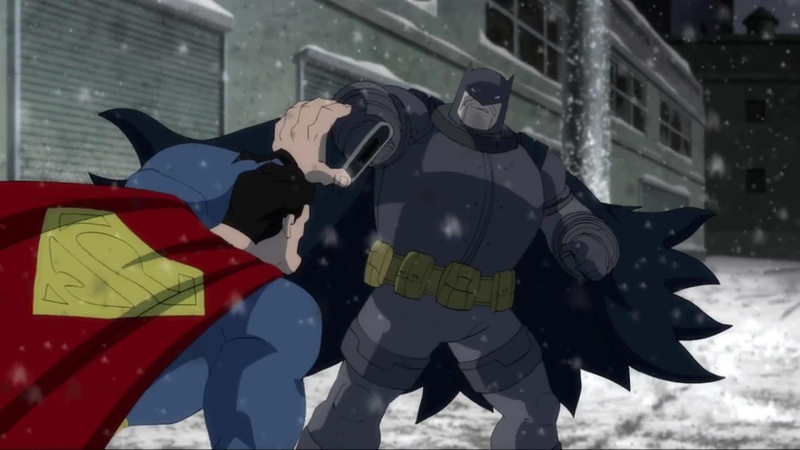 The grizzled, veteran Batman with a stockier frame draws from his depiction in The Dark Knight Returns, as does his use of a full suit of robotic armour to fight Superman. It will be interesting to see how Batman v Superman re-fashions this into a story of the duo’s first encounter, seeing as they’ve already known each other for years at this point in the graphic novel. Star City 2046, the episode of the TV show Legends of Tomorrow, also draws on The Dark Knight Returns, with Oliver Queen sporting a scraggly beard and a robotic arm. This animated movie is based on the Justice League: Originstoryline from the comics, that was the foundation for DC’s comprehensive “New 52” reboot in 2011. The event storyline known as Flashpoint (adapted into the animated movie Justice League: The Flashpoint Paradox) wiped the slate clean, and in this story the heroes of the Justice League, including Batman and Superman, meet for the first time. The story takes place against an invasion of Parademons, Darkseid’s troops. 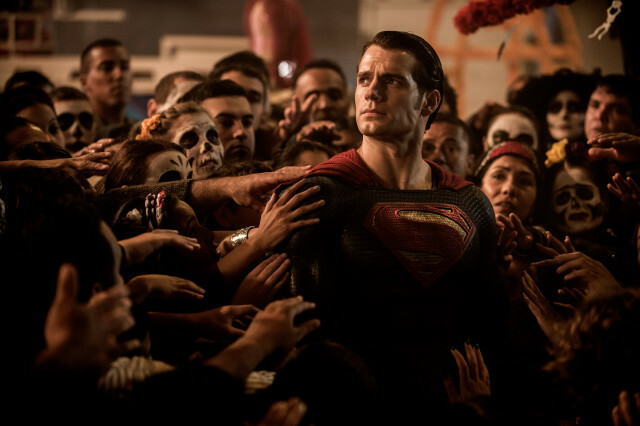 When Batman and Green Lantern first meet Superman, Superman believes the two are working with the Parademons and engages in fierce battle with them. As far as first meetings between Batman and Superman go, this one’s definitely of the “hit first, ask questions later” variety. 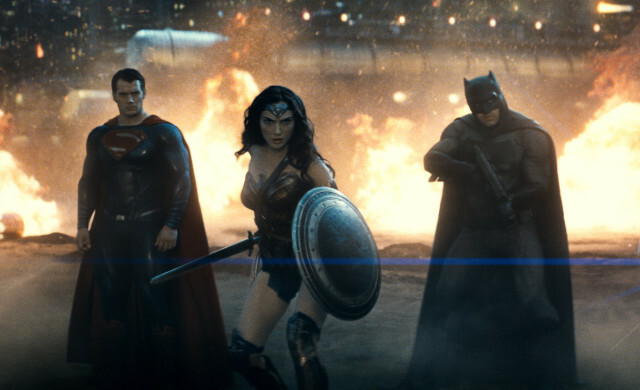 Eventually, Batman, Superman, Green Lantern, Wonder Woman, Flash, Cyborg and Shazam form the Justice League. While some viewers enjoyed the film for its depiction of the heroes not getting along, the drastic changes in the characters’ personalities as part of the reboot did not sit well with others. Several elements of the New 52 will be carried over into the DC Extended Universe, including Wonder Woman’s reworked origins where she is a demigoddess and daughter of Zeus, instead of being carved out of clay by her mother Hippolyta. 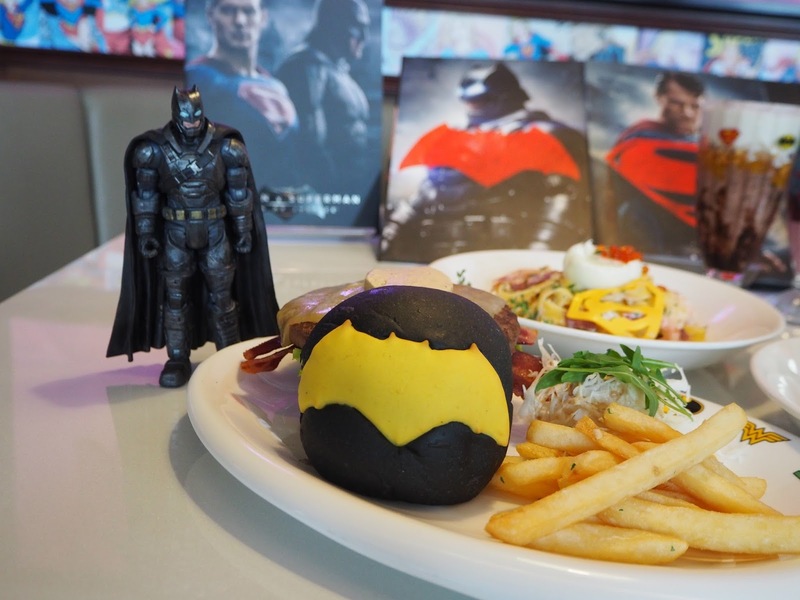 In anticipation of the blockbuster film Batman v Superman: Dawn of Justice, F*** was at the DC Super Heroes Café in the Shoppes at Marina Bay Sands for a media preview event. At the preview, both the exclusive SingPost MyStamp Collection and the café’s new movie-specific menu were unveiled. “How can we miss this epic battle?” SingPost’s assistant vice-president of philatelic and stamps, Peggy Teo, asked as she introduced the collection. 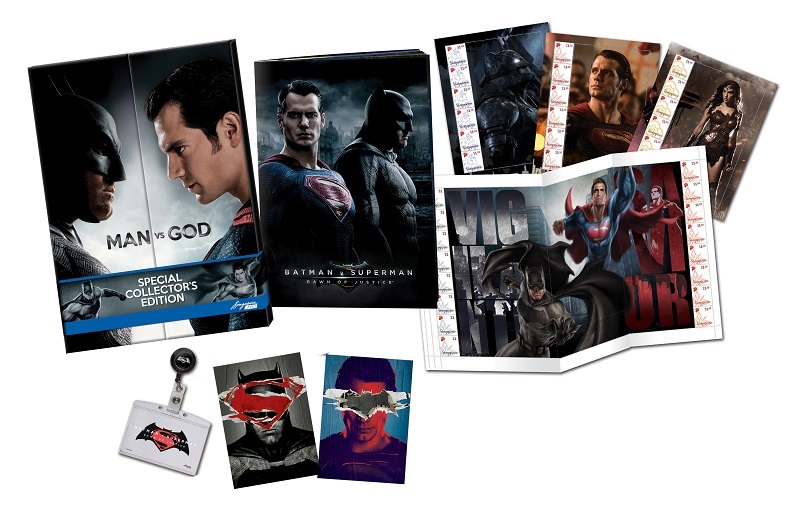 The Singapore Post has partnered with Warner Bros. Consumer Products in the past to commemorate events such as the 75th anniversary of the Batman character in 2014. This time, SingPost is releasing a limited edition 12-page hard-cover collection that includes three souvenir stamp sheets and a retractable lanyard. In addition to Batman and Superman, the stamps will also showcase Wonder Woman, who is making her big-screen debut in Batman v Superman: Dawn of Justice. 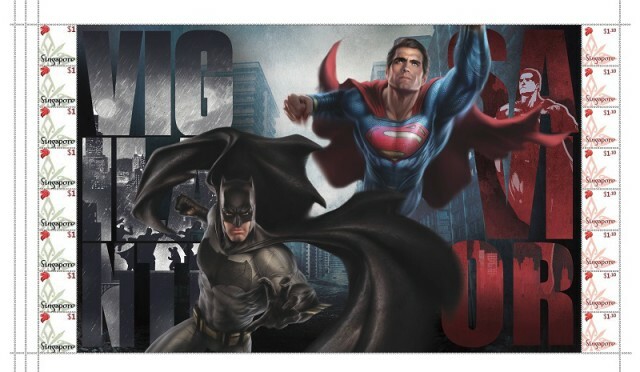 From 24 March 2016, The MyStamp Collection will be available for sale at all post offices, the DC Comics Super Heroes Café, the Singapore Philatelic Museum and online. The set retails at $69.90, but those who pre-order the MyStamp Collection from 11 to 23 March 2016 at www.stampdelight.com will be able to purchase it at $55.90, a 20% discount. SingPost customers who purchase the MyStamp Collection will stand a chance to see the movie for free. The first 50 SingPost customers who post their purchases online and share the contest details or the product launch link with the hashtag #SPBATSUP via SingPost’s Facebook page will win a pair of movie passes. 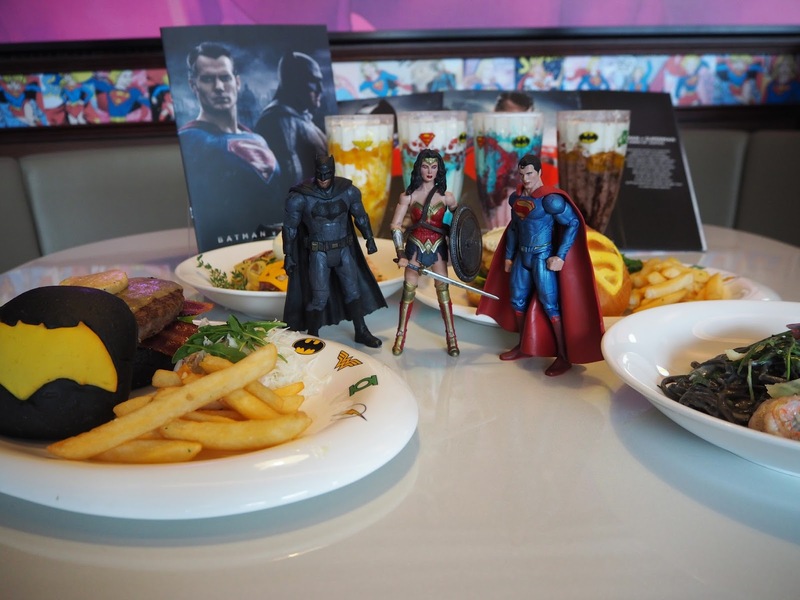 The DC Super Heroes Café is a popular dining destination for families and is decorated with artwork, autographed posters, life-sized statues and collectible figurines. Consulting chef Martin Woo presented the menu items, which are available for a limited period from 17 March until sometime in April. 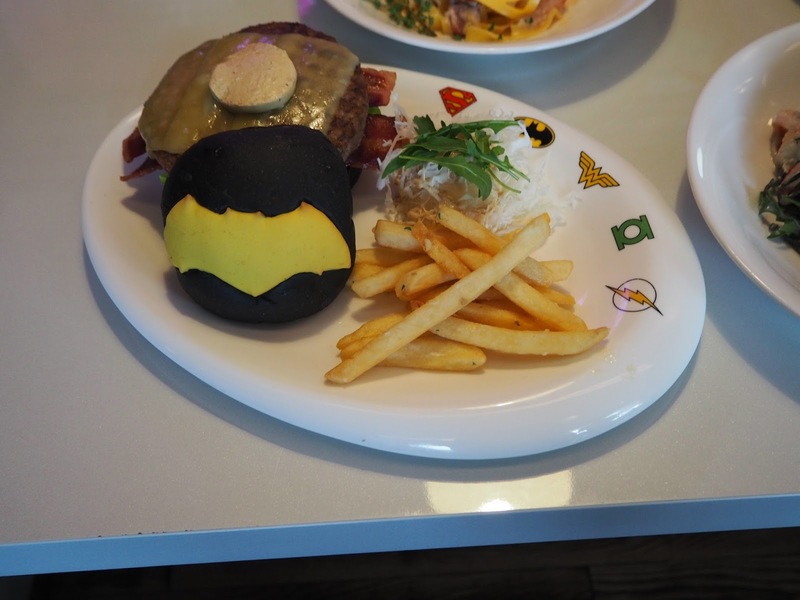 Chef Woo explained his rationale for the dishes – since “Bruce Wayne can afford everything”, more luxurious ingredients such as foie gras butter, Alba truffle sauce, white prawns from the Sea of Japan and Wagyu beef are incorporated into the Batman-themed dishes. 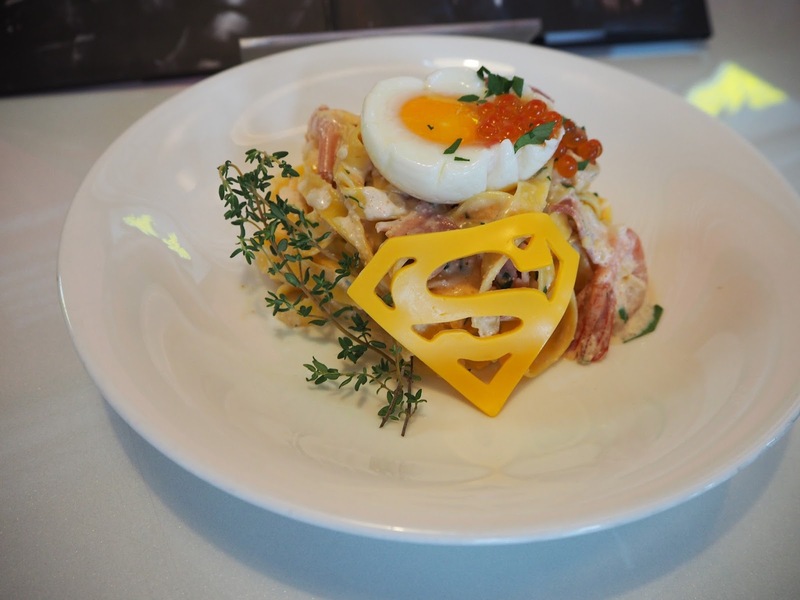 Clark Kent was raised on a farm, so the Superman-themed meals are comprised of “humble ingredients” like free-range chicken, organic eggs, tomatoes and avocado to convey a “sense of familiarity and homeliness”. We were served tasting portions of the new menu items to sate our appetite for justice. Superman’s Free Range Chicken Burger ($27.90 ++) is made up of free range chicken patty, a sunny-side-up egg with Dukkah spice, guacamole, melted cheddar, smoked jalapeno and scallion pesto, tomato, lettuce and peanut butter on a buttermilk brioche bun, served with arugula salad and balsamic dressing. The chicken patty tasted very ordinary, and there was a piece of gristle in ours. The Dukkah spice and pesto, ingredients that were meant to be flavourful, barely registered and the bun was rather dry. The peanut butter did add an unexpected flavour profile and was effective in evoking a sense of nostalgia. Superman’s Pasta Crevettes Carbonara ($28.90++) fared better. The dish of fettuccine pasta, a poached organic egg, mentaiko (cod roe) cream, red prawns, ikura (flying fish roe) and shaved Parmigiano cheese was rich and flavourful. The sauce was perhaps a little too thick but the dish had a pleasant smoked flavour to it. The mentaiko cream and ikura added a touch of fusion flair, even though they have nothing to do with the corn-fed Clark Kent’s farmboy background. Batman’s Wagyu beef Jaw burger ($31.90++) stars Wagyu cheek patty, foie gras butter, cucumber, tomato, lettuce, shaved cabbage, melted Monterey Jack cheese, turkey bacon, apple wood smoked barbeque sauce and sesame dressing on charcoal brioche buns. The Wagyu patty was moist but a little bland; the foie gras butter definitely helped lend the dish a dash of decadence. Unfortunately, the turkey bacon and what tasted like store-bought barbeque sauce cheapened the dish. Batman’s truffle pasta ($26.90++) was, like the Superman Cabonara dish, sufficiently tasty. In it you’ll find squid ink linguine, Alba truffle sauce, sautéed garlic white shrimp tail, arugula salad and shaved Parmigiano cheese. 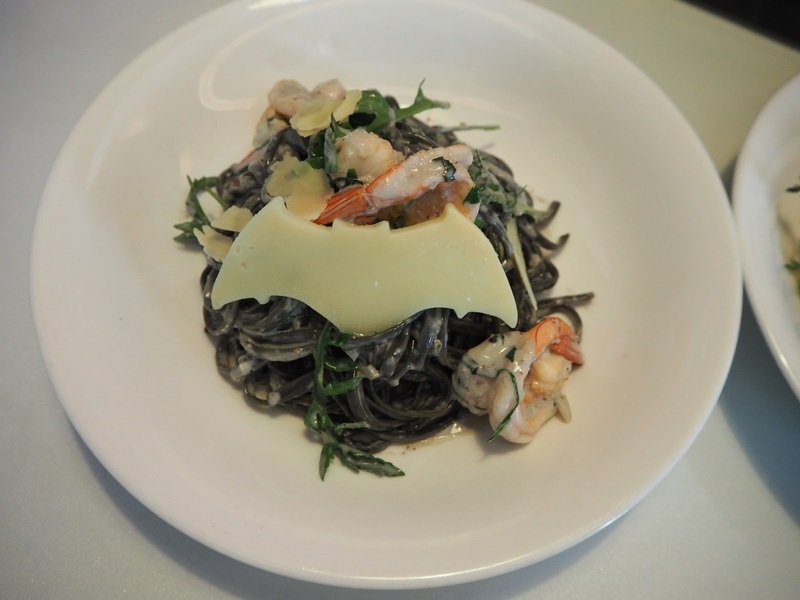 The nutty truffle sauce did make the dish taste quite classy indeed, with the squid ink linguine befitting of the Dark Knight’s preferred colour scheme. The sautéed shrimp could have done with more garlic though. 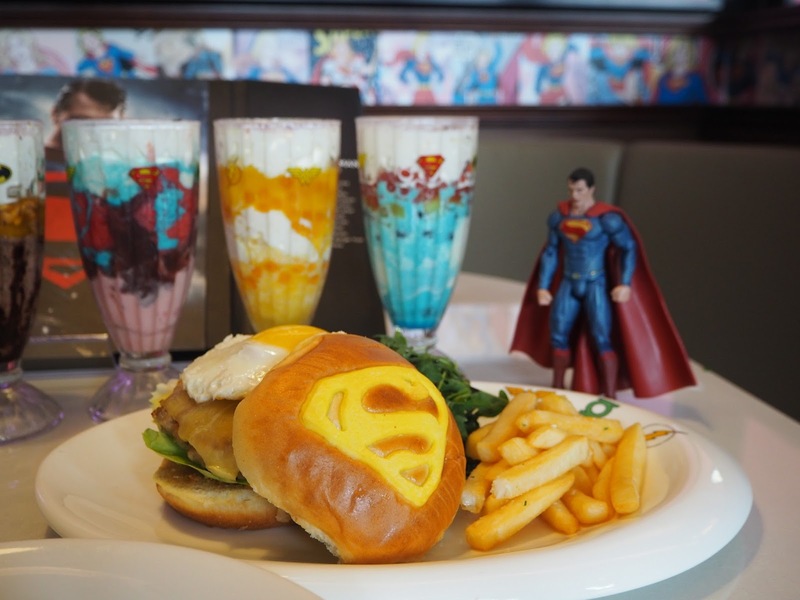 A common criticism of the character of Superman is that he’s boring, and alas, the same is true of the Superman burger. In this culinary face-off, Batman certainly emerges triumphant. 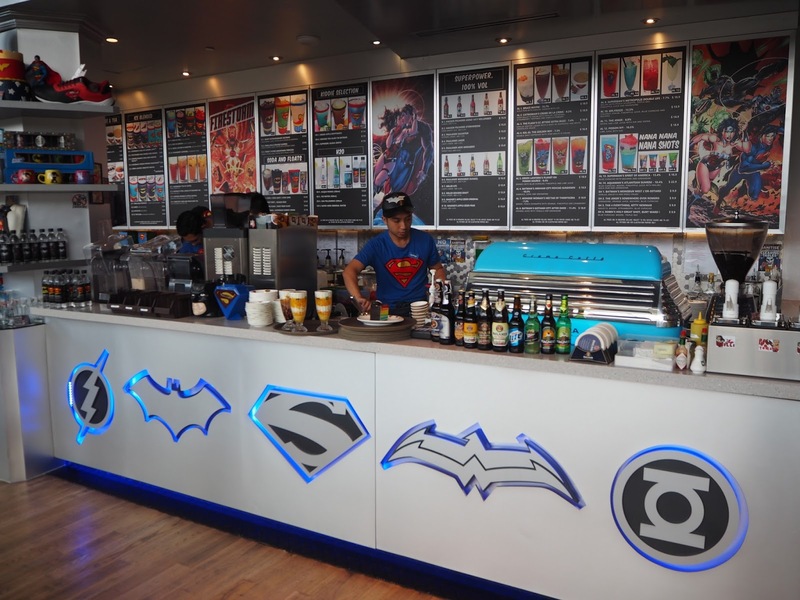 Suffice it to say that we wouldn’t be the first to point out that the food at the DC Super Heroes Café is not the main reason most people visit it. 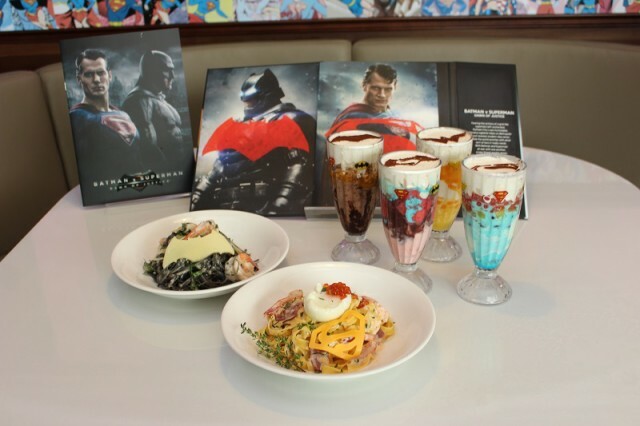 In conjunction with the new menu items, the DC Comics Super Heroes Café also have several movie tie-in promotions going on. The first 500 diners who purchase items from the themed menu will each receive a set of two SingPost movie postcards and MyStamp pieces. The café is also giving out a special movie-themed drink with every purchase of the afore-mentioned Batman v Superman: Dawn of Justice MyStamp Collection. In addition, 20 diners at the café will win a pair of preview tickets to catch the film at a preview screening on 23 March 2016, a day ahead of its 24 March release date. Terms and conditions apply. Action figures depicted are the writer’s own. The Bible tells us that “the truth shall set you free”, but there are times when it can feel like the truth can hold you prisoner, as Cate Blanchett finds out in this drama. 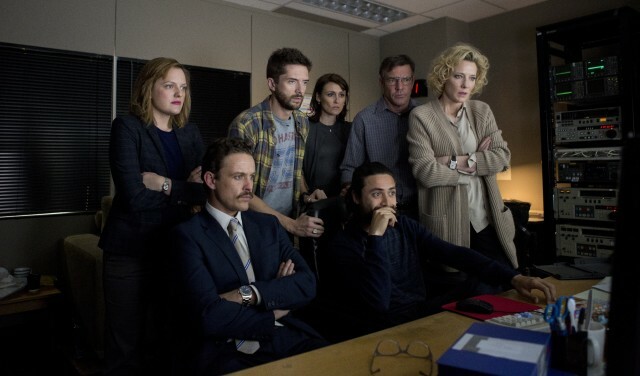 Blanchett plays Mary Mapes, the producer of CBS’ primetime news program 60 Minutes Wednesday. In the months leading up to the 2004 presidential election, 60 Minutes airs a story about President George W. Bush receiving preferential treatment from his superiors at the Texas Air National Guard, with memos allegedly authored by Bush’s commander Lt. Col. Jerry Killian as proof. Mapes, her team and veteran news anchor and 60 Minutes presenter Dan Rather (Redford) come under fire after the program is aired, with multiple viewers calling the veracity of the documents procured by 60 Minutes into question. Rather, hitherto a widely respected figure in broadcast news, finds his reputation threatened as Mapes scrambles to defend herself and prove that 60 Minutes did not lie to the American public. 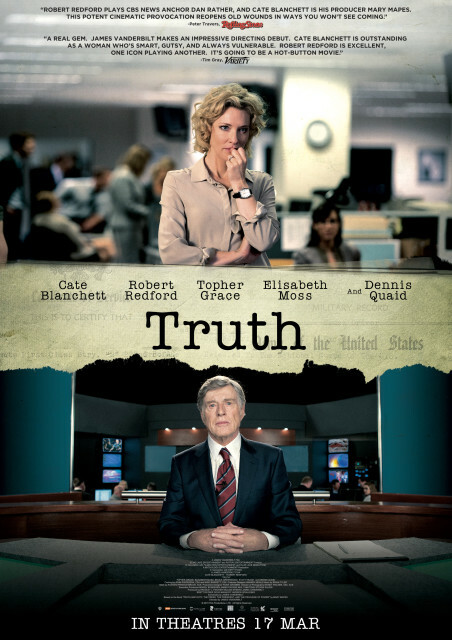 Truth is based on Mapes’ 2005 memoir entitled “Truth and Duty: The Press, the President, and the Privilege of Power.” Writer/director James Vanderbilt adapted the book for the screen and he makes his directorial debut with this film. Because Mapes’ account of events is the primary source, it cannot be expected that Truthis an objective depiction of the Killian Documents controversy, which came to be colloquially known as “Memogate” and “Rathergate”. The 60 Minutes story was one of the first pieces of investigative broadcast journalism to be dissected and torn apart online by bloggers and CBS was blasted for apparently exhibiting a liberal bias by running the anti-Bush story without thoroughly verifying these documents. Somewhere in there, there’s a gripping tale of the profound responsibility that journalists must uphold and Truth did get this reviewer invested in Mapes’ journey, but the film is pervaded with a sense of heavy-handed portentousness and turns out to be far less incisive than it thinks it is. Contrary to its title, Truth can’t help but feel phony at times. While this is a slicker, better-made film than many directorial debuts, Vanderbilt’s attempts to drum up the excitement and establish grave stakes feel slightly overblown. One of the culprits is Brian Tyler’s musical score, which heaves with bombast and sounds like something out of Air Force One. Quaid plays Col. Roger Charles, a member of Mapes’ investigative team, and it seems his primary function is to dispense exposition. There is a cringe-worthy scene set in a plane in which Charles explains to freelance reporter Mike Smith (Grace) that Mapes’ father physically abused her and that Mapes sees Rather as a father figure. There are also so many “what have I done?” moments in which realization dawns on Mapes that the scandal has taken another terrible turn, that it borders on self-parody. 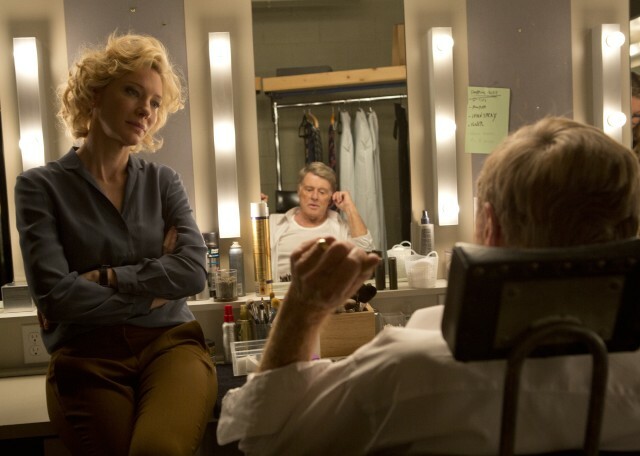 Vanderbilt’s trump card is his cast, especially lead performers Blanchett and Redford who are expectedly excellent. In spite of how many times the story trips over itself, the duo carries it to the finish line in tandem. Blanchett’s Mapes is doggedly persistent and suffers no fools, someone who is dedicated to her job and witnesses her life’s work crumbling around her. Truth would very much obviously like us to take Mapes’ side, and Blanchett’s portrayal of her ensures that we do – at least up until the movie ends and we start reflecting on the proceedings in-depth. Redford bears little physical resemblance to the famous newsman, and when playing someone so recognisable, perhaps physical resemblance should count for something. However, he has no trouble at all creating a warm, trustworthy and respectable figure and the interaction between Redford and Blanchett does possess a degree of heart. The rest of the characters are disappointingly two-dimensional; propping up the story as it progresses – Grace is the comic relief, lying on the couch, tossing a baseball in the air and asking the rest of the people in the room “you guys feel like pizza?” Quaid, as mentioned earlier, recaps things “as you know”-style for the audience. Moss, as associate producer Lucy Scott, has precious little to do. The various CBS higher-ups grumble/yell at Mapes and her team, occasionally flinging objects across the room in frustration. It turns out that securing Blanchett and Redford is a casting coup not just because they’re talented actors but because there’s little else to recommend in the film beyond them. Truth is made with polish but lacks finesse, an indignant cry that is far from altogether convincing in making us re-evaluate the events of over 10 years ago. The film desperately wants viewers to see Mapes and Rather as righteous martyrs laying their careers on the line and going down with their ship, a point of view that CBS has slammed. It’s not a case of “here are the facts; draw your own conclusions” because of the side the film takes, but the look behind the scenes at the politics of journalistic ethics, however flawed, is nonetheless fascinating. Perhaps Vanderbilt did as a good a job as possible with the stipulation that Mapes and Rather must be portrayed as the good guys, but then again, it feels like the title “Truth?” would be a better fit. Summary: Truth is clumsy, preachy and Oscar-baity, not entirely successful in convincing viewers that its protagonists’ lapses in judgement were justifiable and forgivable. 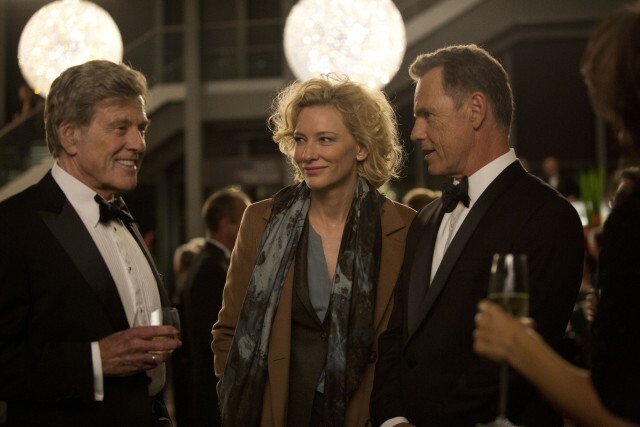 However, it’s impossible to overlook Blanchett and Redford’s stellar performances. “All kinds of weather, we stick together/The same in the rain and sun” – so crooned Rosemary Clooney in the song Sisters from White Christmas. In this movie, comedy duo Amy Poehler and Tina Fey play Maura and Kate Ellis respectively, sisters who return to their childhood home in Orlando after many years. The sisters’ parents (Wiest and Brolin) have decided to sell the house, much to both daughters’ chagrin. The freewheeling Kate coaxes Maura into helping her throw one last blowout party at their house, affectionately nicknamed “Ellis Island”. The many guests who show up include James (Barinholtz), a handyman whom Maura has developed a crush on; slacker Dave (Leguizamo) and his drug dealer Pazuzu (Cena), socially-awkward jokester Alex (Moynihan) and Kate’s high school nemesis Brinda (Rudolph). As the bash spirals out of control, Kate’s teenage daughter Haley (Davenport) learns of her mother’s irresponsible behaviour and with her grandparents, attempts to intervene. The mechanics of Poehler and Fey’s double act are well-oiled to the point where they could rival Crosby and Hope in their heyday. From Weekend Update and the Sarah Palin vs. Hillary Clinton sketches on Saturday Night Live (SNL) to Baby Mama and their stints hosting the Golden Globes, the comediennes have repeatedly brought the funny. Sisters is directed by Pitch Perfect’s Jason Moore, from a screenplay by Paula Pell, whose credits include SNL, 30 Rock and Bridesmaids. The supporting cast consists mostly of actors who are SNL alums or are part of the wider circle of comedians Poehler and Fey know. A good portion of the jokes hit their target, but there’s the hard-to-shake sense that the film leans too heavily on Poehler and Fey’s pre-existing rapport, instead of actually generating funny scenarios for their characters to participate in. Sisters is an entry in the “I don’t want to grow up (I’m a Toys “R” Us kid)” comedy subgenre. There’s a reason characters who are unwilling to move on from their teen years are referred to as “man-children”, because that’s mostly the dudes’ domain. It does riff on the Will Ferrell and John C. Reilly two-hander Step-Brothers, without the over-the-top rivalry. There are multiple points in Sisterswhere it feels like the film is flailing about, yelling “hey, girls can do stupid stuff too!” The vulgarity and gleefully reckless behaviour plus the mix of sentimentality and sweetness come off as very sub-Bridesmaids. The climactic comedic set piece is unexpectedly ambitious and there’s a gag involving a ballerina music box that will make audiences cringe, chuckle and clench, but there are significant portions of the film during which it’s spinning its wheels. 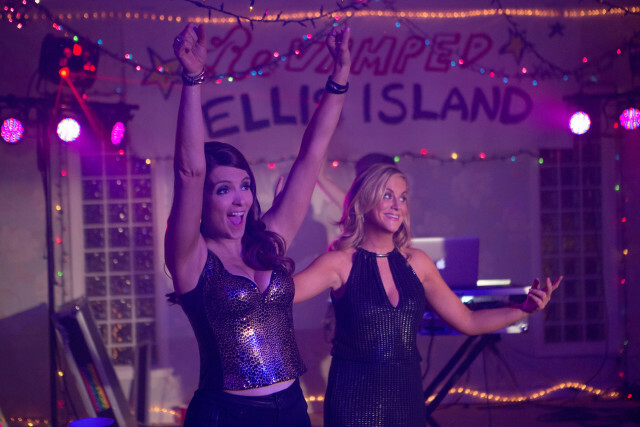 If asked to categorise the two per an old buddy movie archetype, most audiences would pick Fey as the strait-laced one and Poehler as the party animal. Sisters flips the script and Fey gets multiple opportunities to make a scene and blurt out strings of cuss words. Poehler’s Maura does exhibit the “chipper to an annoying extent” trait she’s brought to her roles in Parks and Recreation and Inside Out. Barinholtz’s character is sweet, funny, capable and is very much a “dream guy” archetype but points for not casting an Abercrombie model in the part. Wiest and Brolin are also entertaining as the Ellis sisters’ parents, in part because they’re not necessarily actors one would expect to show up in an over-the-top comedy. The partygoers are all one-dimensional, playing it up for laughs. 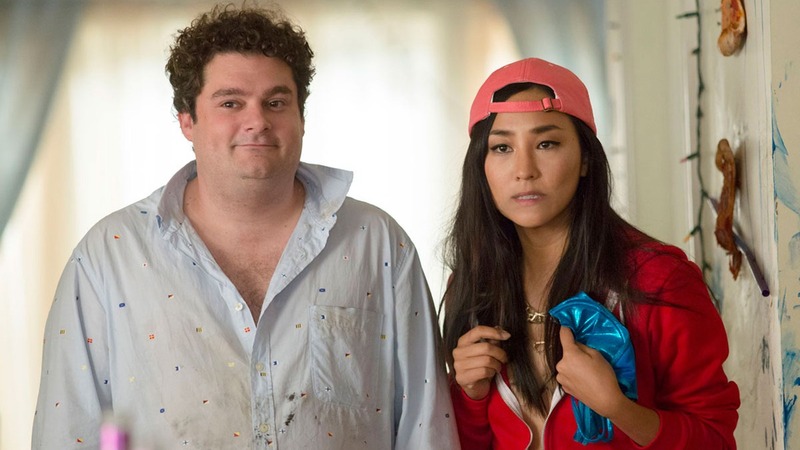 Greta Lee shows up as nail salon technician Hae-Won, a character who’s supposed to deconstruct racist Korean stereotypes but ends up reinforcing them, depending on how sensitive one is to the issue. The character’s broken English further makes things uncomfortable and clumsy. Similarly, a group of lesbian women who show up to the party are portrayed as stereotypically masculine, dressed in denim and plaid and wielding power tools. It’s a disappointing lack of sophistication, especially since writer Pell is an openly gay woman herself. John Cena has wisely capitalised on his status as an internet meme and is proving that he has a knack for comedy, perhaps not unlike Mark Wahlberg and Channing Tatum. The chemistry that Poehler and Fey share is the foundation on which the movie is built; it’s a shame the rest of the construction materials aren’t quite up to snuff. It certainly could have been tighter, sharper and more focused, but it is ultimately difficult not to be swayed by Poehler and Fey’s performances even if they aren’t working with the best material. Summary: It’s far from the best use of Poehler and Fey’s talents and it tends to go for the obvious, easy jokes, but Sisters narrowly passes muster thanks to the duo’s irresistible chemistry. “Do not go online shopping while drunk” – wiser words have rarely been spoken. 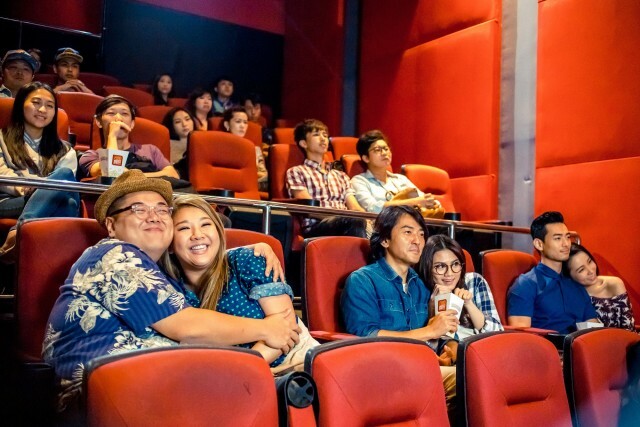 In this sci-fi comedy, Evan (Ekin Cheng) drowns his sorrows with his friends Johnny (Ho) and Irwin (Lam), after the three are dumped by their respective girlfriends. Evan stumbles home and goes online, ordering an “iGirl” on a whim. Two days later, a gynoid programmed with his specific preferences arrives at his doorstep. This is model #2017001 (Chau), or 001 for short. On meeting their friend’s new robot beau, Johnny and Irwin immediately want an iGirl of their own. 002 (Man) is delivered to Johnny, with Irwin getting 003 (Joyce Cheng). As the men help their newfound loves adjust to life as human beings, their ex-girlfriends get wind of the new A.I. ladies in their exes’ lives and plot their revenge. A movie about a man striking up a relationship with an artificially created woman might be a novel premise to Hong Kong filmgoers, but it’s far from a new idea and we’ve already seen films like Mannequin, Weird Science, Lars and the Real Girl, and recently Her and Ex Machina, to name a few. It’s very safe to say that iGirlis far, far worse than all of the above-mentioned films. The movie’s conceptions of gender roles are distasteful and embarrassingly retrograde. Instead of satirising and cleverly commenting on the objectification of women, iGirl instead reinforces that notion. All of the women in the film are either compliant robots programmed to satisfy every whim of their male “masters”, or conniving, manipulative and intensely jealous gold-diggers. It’s a wish fulfilment fantasy that is frankly repulsive, and it’s quite staggering to see something like this in 2016. There is no internal logic to any of the sci-fi elements. With a film that apparently takes place in the present day, it’s natural to expect a pretty good explanation for how such cutting-edge advances in artificial intelligence technology have been made readily available and affordable. No such luck. Believably portraying a robot is a bigger acting challenge than one might think, and none of the three actresses make choices deliberate or distinct enough such that they are convincing as gynoids. The film focuses on three men and their relationships with their respective robot girlfriends; we get a montage showing how they’re progressing and it just so happens that each couple hits exactly the same points in their journey as the other two. The visual effects work is largely cartoony and there’s an inexplicable fight scene towards the film’s conclusion that’s just a mess. Ekin Cheng, a heartthrob back in the 90s, seems to be a little past the age to be playing this character, who is written like he should be in his late 20s or early 30s as opposed to Cheng’s 48. There are some reasonably sweet moments that he shares with leading lady Chau, but these are few and far between. The characterisation of Evan’s friends does not go past “Johnny is the vain one and Irwin’s the fat one”. The inventor of the iGirl, ludicrously named “Dr. Intelligence”, is bland instead of enigmatic. iGirl is the directorial debut of Kam Ka-wai, but is co-produced by Wong Jing, basically Hong Kong’s equivalent of Michael Bay. In China, iGirl is being released exclusively via the online video service iQiyi, targeting “young netizens”. It seems Wong has severely underestimated the intelligence of said “young netizens”. The possibilities of a relationship between man and shapely machine have proven to be worthwhile fuel for the imaginations of many filmmakers, dating as far back as Fritz Lang, whose expressionist sci-fi Metropoliswas released in 1927. Even earlier, there was the Pygmalion myth. That iGirl fails to do anything interesting with inherently meaty subject matter is disappointing. Summary: A shallow, misogynistic comedy that fails to add anything remotely meaningful to the canon of films about humankind’s relationship with artificial intelligence. Out on the streets, it’s never black and white – though sometimes it is red, owing to the dye packs that permanently stain stole cash. Oh, the red is also often blood. Criminals Michael Atwood (Ejiofor), Russell Welch (Reedus) and his brother Gabe (Paul), along with corrupt cops Marcus Belmont (Mackie) and Franco Rodriguez (Collins), have been committing armed bank robberies. The crew is working for Irina Vlaslov (Winslet), the wife of a powerful Russian Mafioso. Michael has a son with Irina’s sister Elena (Gadot), further complicating matters. To pull off another job, Marcus and Franco suggest calling in a code “999”, i.e. killing a cop to distract the rest of the police force so the crew can break into a government office and steal data concerning Irina’s husband. Their target is Chris Allen (Affleck), Marcus’ new partner who has transferred from a different district. Chris’ uncle happens to be Sgt. Det. Jeffrey Allen (Harrelson), who is tracking down the bank robbers. The stage is set for all-out war on the streets of Atlanta, Georgia. First off, we would like to get that “oh, this stars James Lye, Wong Li-Lin, Lim Yu Beng and Mark Richmond” joke out of the way. If you were watching Singaporean television in the 90s, you know what we’re talking about. 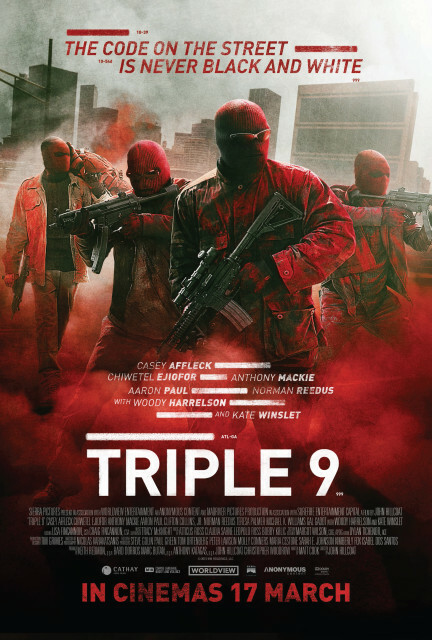 Anyway, Triple 9’s screenplay, written by Matt Cook, landed on the 2010 Black List of most-liked scripts making the rounds in Hollywood and has finally been produced. At the helm is John Hillcoat, who directed the revisionist western The Proposition and the prohibition-era bootlegging drama Lawless. 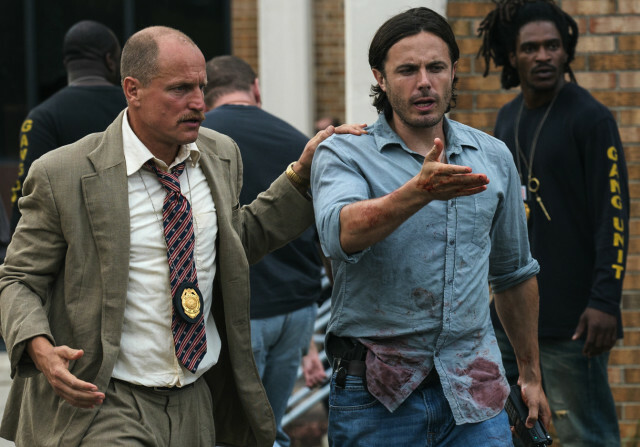 Triple 9 is a scuzzy, grimy crime thriller which liberally borrows from the likes of Training Day and Heat. The action sequences are messy and frenzied; our protagonists are mostly criminals who don’t get along; we deal with the theme of honour (or lack thereof) among thieves and there’s an abundance of street-level violence. 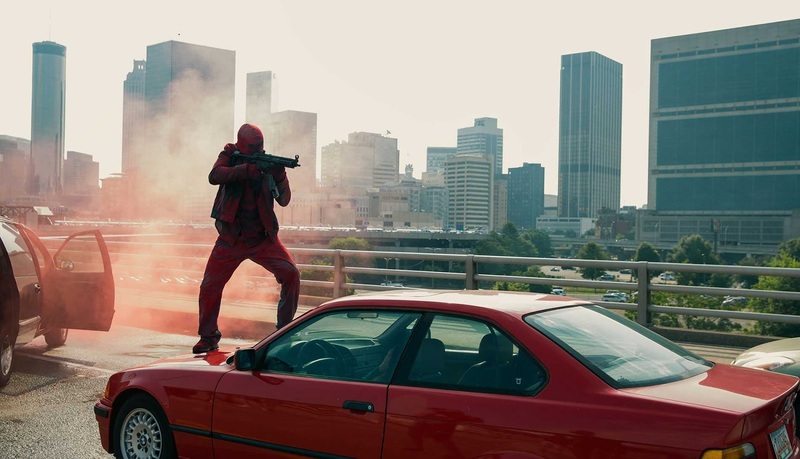 There are many points where Triple 9’s plot feels like it comes straight out of a direct-to-DVD action flick starring 50 Cent and a pre-Mr. Robot Christian Slater. Hillcoat has managed to assemble an impressive cast and it’s impossible not to have high expectations looking the list, which comprises an Oscar winner, Oscar nominees and dependable character actors. Sometimes, seeing a name actor covered in tattoos and scars, all sweaty and grimacing while toting a gun, can feel like we’re just watching a pampered star play dress-up. 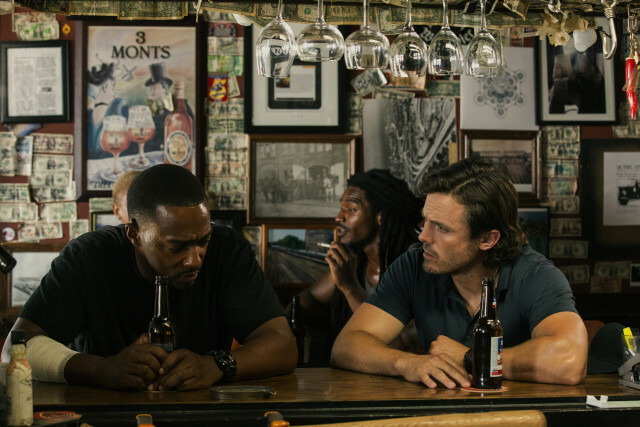 For the most part, Triple 9does feel fairly authentic, with the city of Atlanta actually getting to play itself instead of doubling for some other locale. Nothing feels prettied up, nothing’s slick and shiny and the situations are overblown but not ludicrously so. Winslet chomps the drab scenery as the main villain of the piece, a stereotypical mob wife who’s been handed the reins of underworld power while her husband sits it out in a Russian prison. It’s a character even more ridiculously evil than Jeanine Matthews in Divergent and Insurgent. Gadot and Palmer are there to strut about in abbreviated outfits, providing eye candy and doing little else. Harrelson also doesn’t get a chance to work his offbeat, quirky charm in a role that could’ve been played by pretty much anyone. Triple 9 is a disappointingly generic crime flick that is elevated ever so slightly by its formidable cast. Not too much of a spin is put on the crime thriller formula and the would-be shocking twists and turns in the last act fail to have much impact at all. Hillcoat keeps things moving along and consciously avoids stretches of exposition, but that has the side effect of making the connections between the characters a little confusing to keep track of. At 115 minutes, it’s also a mite too long and could do with some tightening up. But if you’ve a taste for this sort of thing, you’ll probably find Triple 9 to be a competent thriller set on the mean, mean streets. 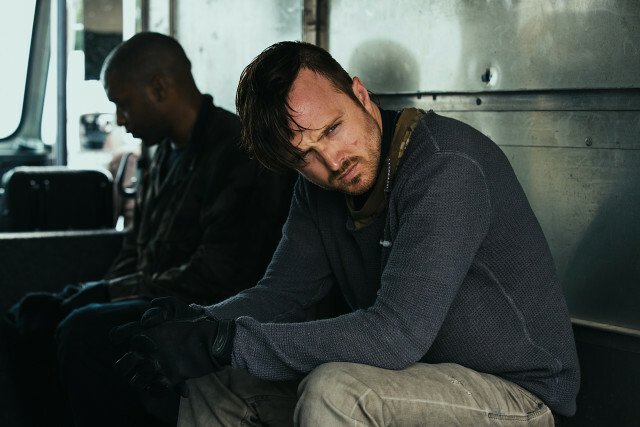 Summary:It fails to live up to the expectations generated by that cast list, but Triple 9 has enough brutal thrills and cops-and-robbers intrigue to scrape by. The rotund, ever-enthusiastic harbinger of awesomeness himself, Po (Black) the Dragon Warrior, has returned to deliver swift justice and wolf down dumplings in the third instalment of the Kung Fu Panda series. The fiendish spirit warrior Kai (Simmons), who formerly fought alongside Master Oogway (Kim), is intent on capturing the chiof all the kung fu masters throughout the land, imprisoning them within jade amulets. In the meantime, Master Shifu (Hoffman) announces his retirement and tasks Po with training the Furious Five, comprising Tigress (Jolie), Viper (Liu), Monkey (Chan), Mantis (Rogen) and Crane (Cross). While Po struggles with his new responsibilities, his biological father Li Shan (Cranston) arrives to take his long-lost son to a secret panda village. This incites the jealousy of Po’s adoptive father Mr. Ping (Hong). When Kai has his sights set on the panda village, Po must transform his ungainly kin into a fearsome army to defeat their powerful foe. 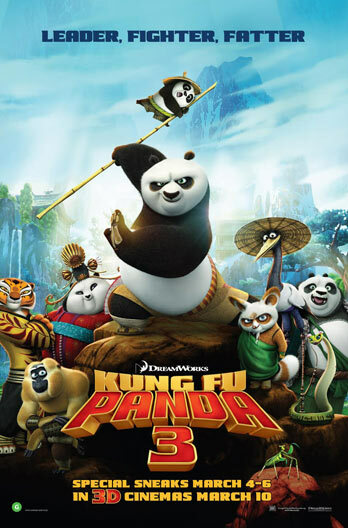 It can be said that 2008’s Kung Fu Panda was something of a turning point for Dreamworks Animation, eschewing excessive popular culture references (but still keeping an all-star voice cast) in favour of something more character-driven, drawing upon Chinese culture for design and story elements. Kung Fu Panda 3 retains much of what made the first two films appealing: it’s breath-taking to look at, the characters are loveable and it’s heartfelt. However, true poignancy seems just out of the movie’s grasp, and the philosophy being dispensed doesn’t go much deeper than “believe in yourself”. Also, even though the stakes seem pretty high, with an immortal villain going after all the kung fu masters in the land, the sense of devastation is insufficient. These films have to strike a balance between depicting battles against evil and kid-friendly goofing off. The scales are ever so slightly uneven here. What’s great about Po is there are still lessons for him to learn and challenges for him to conquer; he might have come a long way but there’s still a distance to go yet. This film delves into Po’s crisis of identity: he’s been raised by a goose his whole life, but then his actual dad enters stage left and introduces him to a whole village of pandas he’s never known. What does this make Po? It’s roly-poly slapstick first and depth second, but it counts for something that the filmmakers have figured out a way to keep Po’s character from reaching a comfortable plateau. Black wears the role like a second skin and Po’s earnestness, fanboy attitude and moments of self-doubt are traits many viewers identify with. Kai has all the makings of a formidable villain, but something’s missing and this reviewer can’t quite pinpoint what. As the series’ first supernatural baddie, he’s easily the most powerful of the foes Po and company have faced off against. Simmons does a decent gruff bellow and the character design is physically imposing. 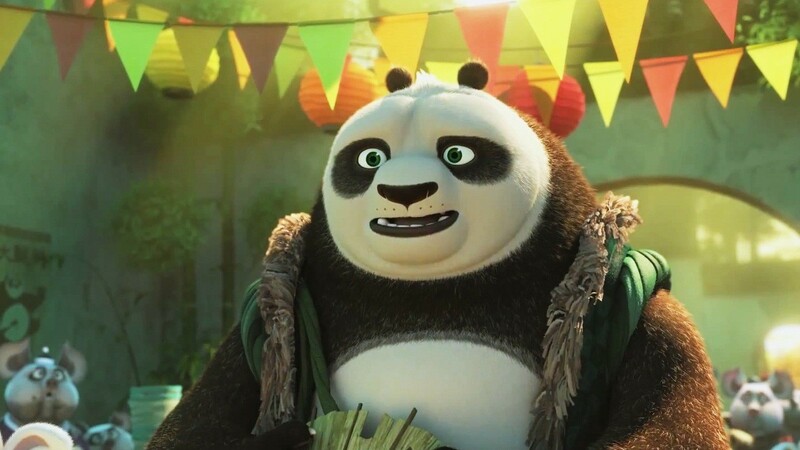 In terms of impact, he is perhaps on par with Tai Lung from the first film but lacks the almost unsettling menace of Kung Fu Panda 2’s Lord Shen. His motivations are also significantly less developed than those of the afore-mentioned previous antagonists. Cranston contributes an affable warmth to the part of Li Shan, with a “dopey dad” vibe that brings to mind his role as Hal in Malcolm in the Middle. The conflict between Po’s two dads seems like a stronger driving force for the story than the oncoming threat of Kai’s attacks. Ping’s initial suspicion of Li Shan and how he comes to terms with the fact that Po’s biological father is back in his life is both funny and touching, giving Hong a little more to do than just be the fussbudget. Of the Furious Five, Jolie’s Tigress gets the most screen time and the team’s resident stoic gets to show a little bit of a soft side as she bonds with a little panda girl. It seems like Mei Mei, a panda who has amorous designs on Po, was originally given more to do in the story. As it stands, the character is largely inconsequential. Perhaps it stems from the re-casting of the role, with Rebel Wilson replaced by Kate Hudson due to scheduling conflicts. The martial arts sequences choreographed by animator Randolph Guenoden continue to be outstanding and a portion of the film takes place in the Chinese spirit realm, which changes the look up a little. There are a number of specific lines and jokes that are direct call-backs to the first two movies, which should make watching all three back-to-back somewhat rewarding. As far as we’re concerned, the franchise has yet to outstay its welcome, but Kung Fu Panda 3 shows signs of why one might be worried. Summary: Kung Fu Panda 3 is spectacularly animated and gives Po more character development, but its underwhelming villain and emotional arcs that show promise but fall short of sublime are a bit of a disappointment. The Coen Brothers peel back the curtain on the turning cogs of the ‘50s Hollywood studio system machine in this comedy. Eddie Mannix (Brolin) is a fixer employed by Capitol Pictures, who has to ensure that celebrities’ dirty laundry remains in the hamper. When Baird Whitlock (Clooney), the star of the blockbuster Biblical epic Hail, Caesar!, is abducted, it’s up to Mannix to procure the $100 000 ransom and rescue the actor. Hobie Doyle (Ehrenreich), another one of Mannix’s clients, is a “singing cowboy” actor who is cast in a period drama helmed by prestigious director Laurence Laurentz (Fiennes) in the studio’s attempt to push him as a big star. He is drawn into Mannix’s mission to find Whitlock. Other figures working on the Capitol Pictures soundstages include actress/synchronised swimmer DeeAnna Moran (Johansson) and song-and-dance man Burt Gurney (Tatum), who harbours a dark secret. At the time of writing, Hail, Caesar! has an 82% score from film critics but only a 45% audience score on review aggregating site Rotten Tomatoes. The Coens’ tribute to 50s Hollywood is certainly geared towards cinephiles and packs in plenty of nostalgic period detail, with plenty of homages to the tropes and styles of that era’s moviemaking business. There’s a freewheeling frivolity to the film that might alienate those unfamiliar with the historical context in which the Hail, Caesar! is set. There are Easter Eggs and references galore, most of which were lost on this reviewer. In addition to drawing on the films of Old Hollywood, the Coens reference their own back catalogue: the fictional Capitol Pictures studio also featured in Barton Fink. The Coens have written and directed some startlingly bleak black comedies, and in contrast, Hail, Caesar! is a frothy and frolicsome enterprise. By having the main character be a studio fixer, whose job it is to keep everyone in line and on brand, the Coens have the opportunity to satirise the iron grip the Old Hollywood studio system had on its contract stars. We do get some of that, to be sure, but the film favours silliness over bite at every turn. Because of the clout the Coens have built up over their career, they have access to some big names and many of the cast members in Hail, Caesar! are returning Coen Brothers alumni. 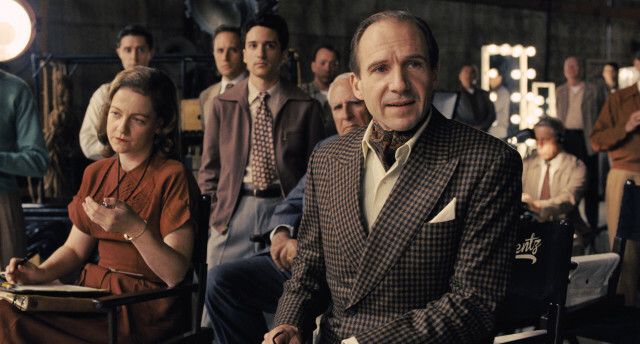 Eddie Mannix is a fictionalisation of the real-life Hollywood fixer-turned producer of the same name. Brolin captures the character’s strong work ethic and is a reliable straight man of the “comically serious” variety, trudging through the over-the-top shenanigans that occur throughout the film. 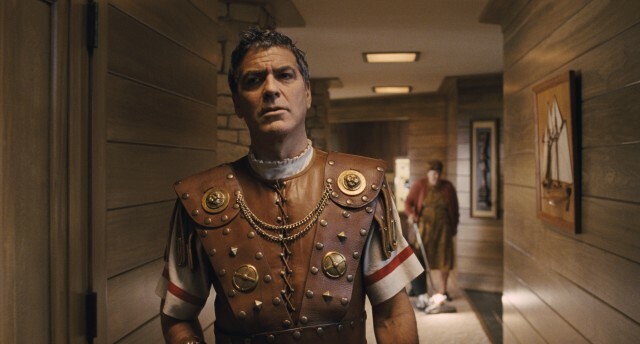 In O Brother, Where Art Thou?, Intolerable Cruelty and Hail, Caesar!, Clooney plays characters who aren’t too bright, forming the so-called “numbskull trilogy”. Here, Clooney’s Baird Whitlock is modelled after Kirk Douglas; his character in the film-within-a-film being a Roman centurion who is eventually moved by the power of Jesus Christ. Clooney’s lackadaisical charm shines through; Clooney clearly very comfortable working with the Coens. A selection of famous faces pop up in extended cameos that could be described as “gratuitous” if one isn’t in a particularly charitable mood – but we’ll be darned if the casting isn’t spot on. Swinton hams it up in a dual role as rival gossip columnists who happen to be twin sisters. Coens oft-collaborator Frances McDormand is a film editor who has a scarf-related mishap and Jonah Hill shows up as a surety agent. Johansson plays an Esther Williams-esque actress and participates in a lavishly choreographed synchronised swimming sequence. Her character is perceived as sweet and elegant, when she’s actually a surly, irascible chain-smoker. Tatum is absolutely hilarious here, while also getting to show off some very fancy footwork in a tap dance number that’s a tribute to Gene Kelly. Ehrenreich may not be as well-known as his co-stars, but he’s plenty likeable as the unrefined singing cowboy who has his life taken over by the studio. 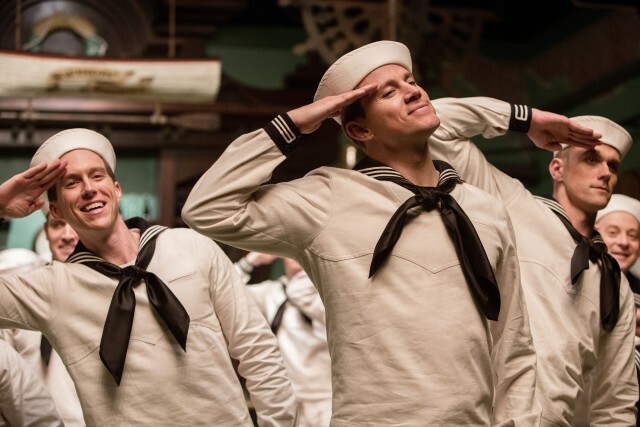 Hail, Caesar!is plenty of very broadly played fun and is sure to appeal to viewers who have an affinity with the movies of 50s Hollywood and the behind-the-scenes gossip that came with them. Alas, it’s far from the Coens’ sharpest material and there are instances where they seem to be caught up in the minutiae and get a little carried away with their elaborate odes to this bygone era of filmmaking. This can be viewed as something of a companion piece to Trumbo, set against the same political climate in Hollywood but played straight, natch. If it’s nostalgia, whimsy and a couple of intricately staged musical numbers that you’re after, the Coens have got you covered. 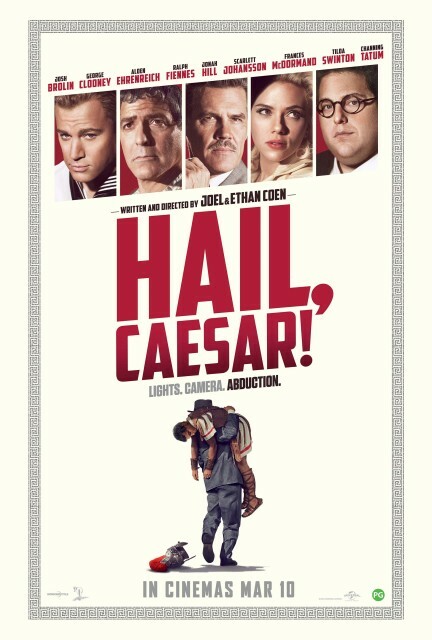 Summary: A light-hearted romp through 50s Hollywood, Hail, Caesar! is packed with loving homages but does play a little too “inside baseball” for non-initiates to get into.